Been searching for that just right home? 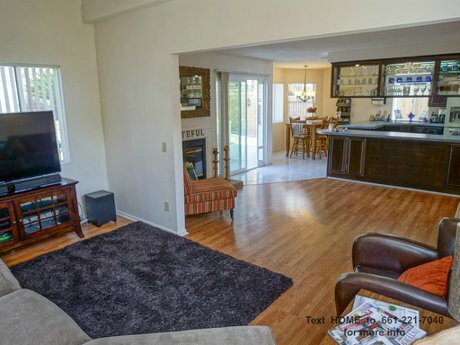 The one with an open concept living area? 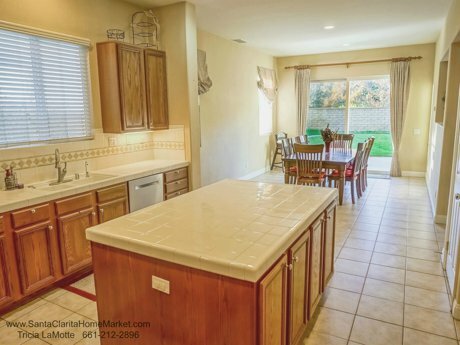 With a kitchen that all the family and friends can gather around - complete with Wolf appliances, a center island, and oodles of counter space and cabinets? Yes, and the pantry, and the computer/planning desk. Check out the latest gourmet recipes, then slide over to the 5 burner gas Wolf cooktop for your next culinary treat. There is plenty of room for the kitchen crew to join in, because the informal eating area is roomy enough to accommodate a large table, and the adjacent family room features a tile fireplace with a raised hearth for extra seating. And of course the plantation shutters in the family room, living room and dining room create that extra special ambiance. Also downstairs is a game room, which could certainly be an office, or even made into an additional bedroom if needed, making it adjacent to the downstairs full bathroom. 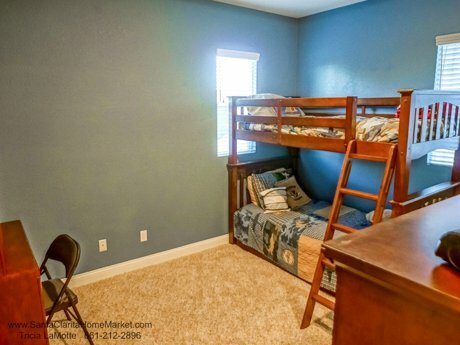 This would be a great option if you have another family member needing a downstairs bedroom. The very private gym is a sound proof room, and could be a music or recording room/studio; this room could also be an office or additional bedroom, creating the potential for up to 7 bedrooms in this home! 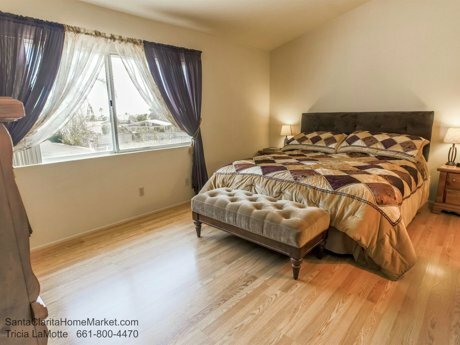 There are 4 bedrooms, including the master suite, and a large loft upstairs - all with beautiful wood floors. 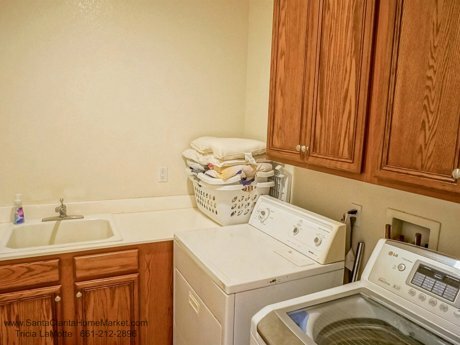 The large laundry room is conveniently situated upstairs, and there is a spacious walk-in linen closet. The loft could be converted into an additional bedroom if needed. 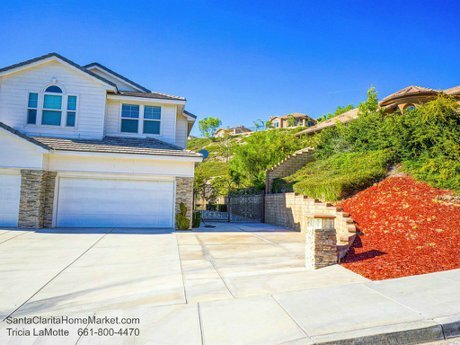 This very inviting home is situated at the top of the hill in the Hillcrest area of Castaic, CA. 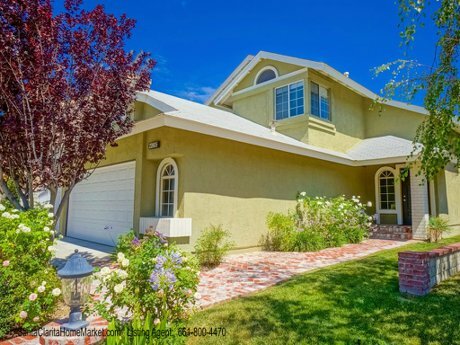 For more information or to schedule private showing, contact the listing agent, Tricia LaMotte, 661-212-2896. A location that invites you to walk! 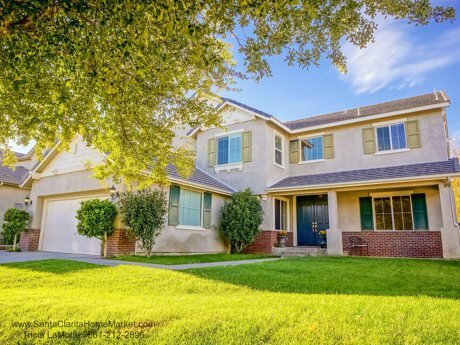 This beautiful two story Valencia Old Orchard home is close enough to walk to schools, places of worship, shopping, restaurants, public transportation, and a nearby park. And no need to drive more than a few minutes to get to the freeway for the commuter. 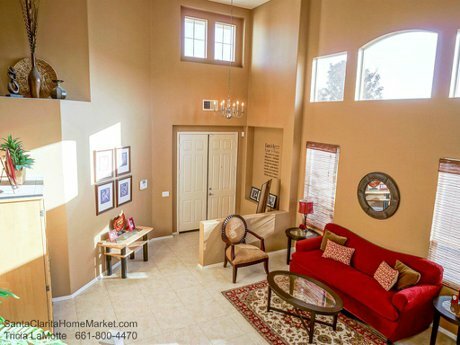 The popular Mirador floor plan has 2336 square feet of living space, and a 2 car garage with lots of storage space. This well priced home of $590,000 will provide the discerning home buyer with desirable amenities and upgrades, such as a newer roof with extra insulation, solar system, dual pane windows, and central air conditioning. All of which add to energy savings, which lowers the monthly expenses, giving the opportunity to enjoy other things in life! Very attractive curb appeal welcomes you the moment you drive up to this lovely home. The inviting landscaping has been well maintained, and the covered front entry porch provides a spot to enjoy the morning sun, a cup of coffee, or enjoy a chat with a neighbor. The custom extra wide driveway indicates the attention to detail throughout this beautiful property. The front door open into a wide wood floored entryway with high ceilings; the curved staircase leads to the upstairs landing. There are 4 bedrooms upstairs: the master or main bedroom suite, and 3 additional secondary bedrooms. Downstairs you will find the living room, dining room, kitchen, family room, and 5th bedroom/office, and a bathroom. The family room is open to the kitchen, and features an updated fireplace with a beautiful travertine stone full room width hearth. The wide sliding doors are covered by plantation shutters and lead to the backyard and large patio. The kitchen has been updated with recessed lighting, granite counter tops, tile floors, plantation shutters and windows overlooking the backyard and view of the open sky. It's so nice not to have a house blocking the view of the sky! The living room and dining room make a great place for a game room in your taste runs to a more informal lifestyle. There is plenty of room for a large dining table, and as you can see from the photo a pool table fits very nicely! The cozy fireplace is just another reason to spend time in this inviting room. There are plantation shutters on both the living room and dining room windows. 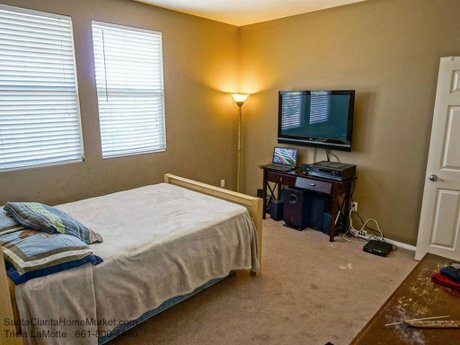 The large downstairs bedroom with laminate wood floors, scraped ceilings, and a sliding glass door to the side patio. This room is currently being used as a hobby room. It could also be an office. 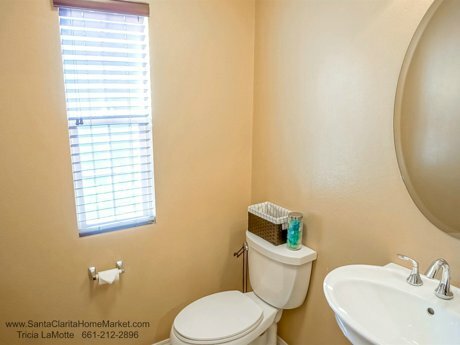 The remodeled bathroom is conveniently located to the bedroom, and features a convenient step in tile shower, travertine counter top with custom basin, and tile floors. The bedroom and bathroom combination would be convenient for an older relative, someone with troublesome knees, or a guest. And if you are relocating to the Santa Clarita Valley area in California...you just may have a guest now and then! The upstairs hall overlooks the impressive entryway, and is wide enough for furniture. There is an extra deep storage closet in the upstairs hall. The solar light tube also provides light to this area...another energy saving device! 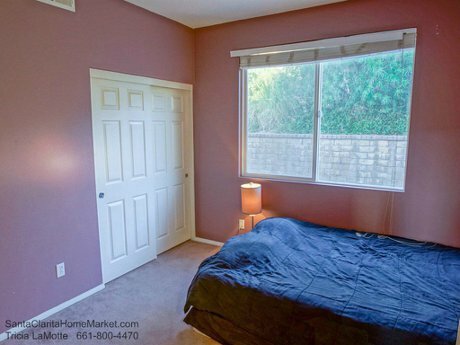 The spacious upstairs master bedroom is well lit with corner windows, and plenty of wall space for furniture. There is extensive closet space with mirrored closet doors. 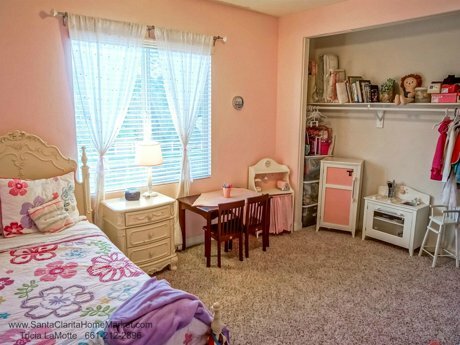 This bedroom has high ceilings, a ceiling fan, carpeting, and wide baseboards. 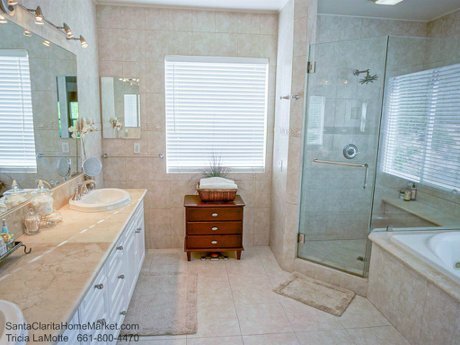 The remodeled master bathroom has travertine stone counters, a custom basin, beveled mirror, and beautiful tile shower. The second upstairs bedroom has carpeting, wide baseboards, a mirrored closet, and a pretty view of the nearby parkway, and the skies toward the west. 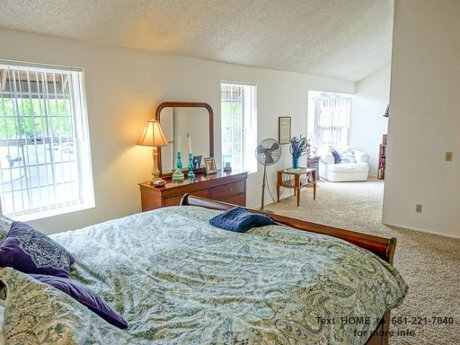 The third upstairs bedroom has carpeting, a ceiling fan, wide baseboards, a mirrored closet door. The fourth upstairs bedroom has a unique ceiling with crown molding, wide baseboards and carpeting. The windows have blinds. The room has a well lit, cheerful feeling. 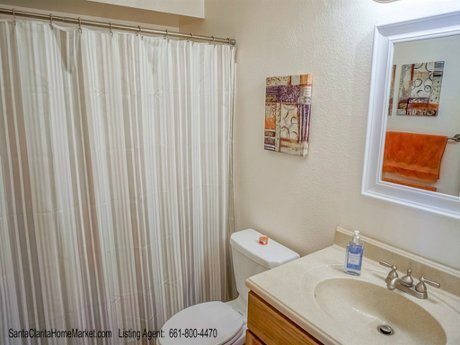 The remodeled upstairs bathroom has a solar light tube, attractive wood floors, a stylish glass shower/tub panel, and modern pullman and counter top. The backyard has a vacation feel with the palm trees, grass area, and spacious patio area for relaxing and alfresco dining. The well trimmed hedges and vines on the walls provide a lush backdrop to the private backyard, and unobstructed view to the western skies. No houses, or neighbors, looking down from behind your house...for the home owner who prefers a more private backyard! 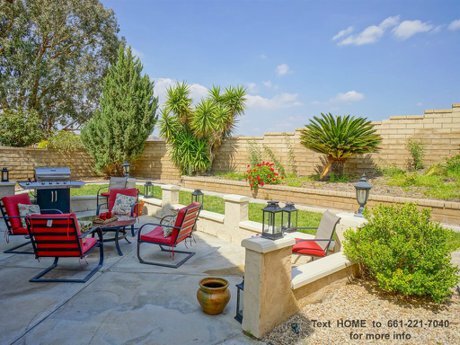 In addition to the backyard, there is a wide gated side yard patio. With all the convenience of this location also comes the advantage of no Mello Roos (an extra bond that is paid in addition to property taxes), and no HOA dues. The Valencia paseos - the approximate 30 mile walkway system that meanders through the Valencia neighborhoods is nearby; as well as the walking and bike path. For more information on this beautiful home contact the listing agent, Tricia LaMotte. 661-212-2896. 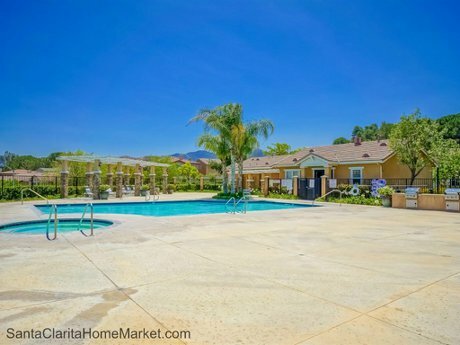 Looking for a wonderful location in Valencia with excellent community amenities? 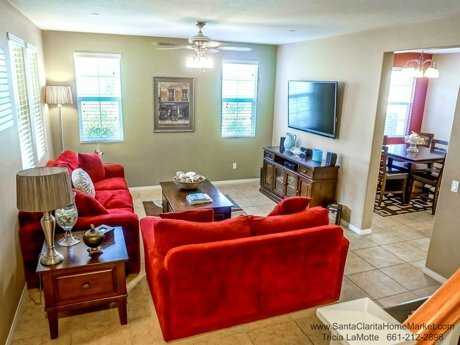 This is the West Creek townhome you have been waiting for! 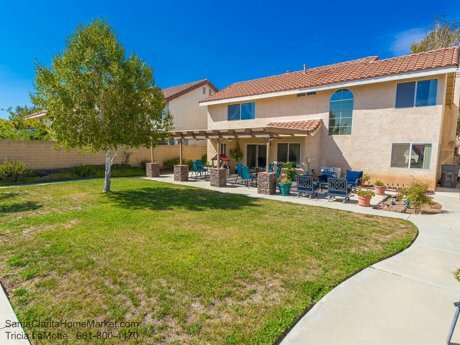 Call Tricia LaMotte 661-212-2896 for information or to schedule a showing. 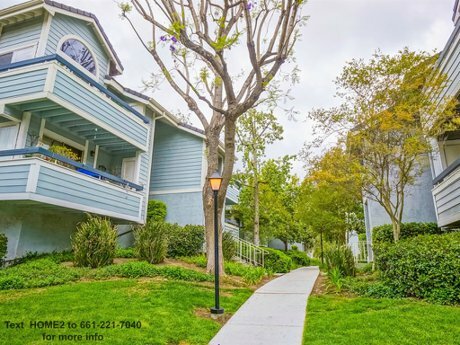 Walk down a beautifully landscaped path to this beautiful two story end unit townhome. 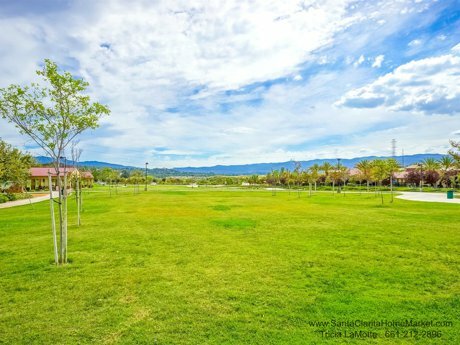 The West Creek community in the master planned community of Valencia offers delightful greenbelts and places to walk. 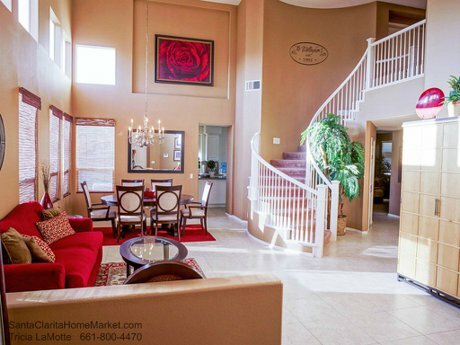 Lovely roses welcome you to the private location and lovely exterior of this 3 bedroom home. There is even a place to sit by the tree and do some cloud watching! The private covered front patio is a great spot to relax and have a quiet conversation; or a place to cook your favorite barbecue. The patio can be reached from the home's interior entry. This particular location in the Esperto tract offers a view of the landscaped hill, which will only get more lovely in time! Once you walk into the living room, you feel at home. The large tiles and warm earth tones on the walls create a comfortable relaxing atmosphere. The windows look out to the landscaped slope and have blinds. The ceiling fan and light provide additional comfort. Yes, of course the home has central air conditioning! There is an extra large storage closet in the living room that extends under the staircase and an additional coat closet. This is the largest model in the Esperto townhome collection in the master planned community of West Creek. The dining room is adjacent to the kitchen and provides a casual setting that is great for family and friends gathering around. The tile floor makes for easy care, and the blind covered windows look out to the landscaped slope. 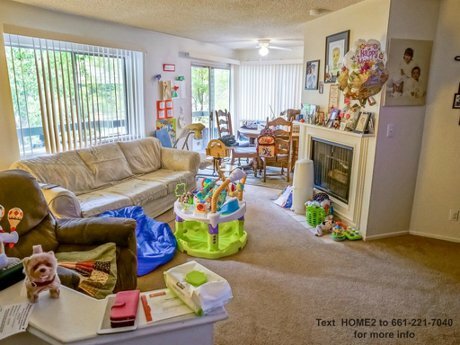 This great location brings a private feeling with no side neighbors or street parking in view! 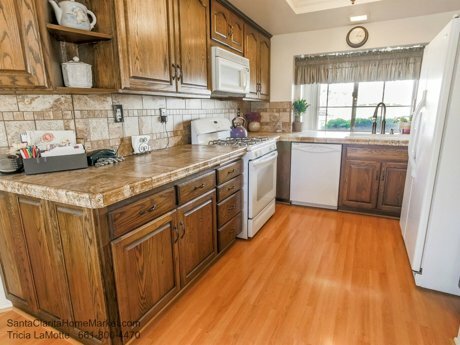 The kitchen features upgraded maple cabinets, granite counters, including the raised bar counter. The five burner stove has a warming tray. There is a microwave and a dishwasher. The tile floors are through the downstairs. There is convenient access to the garage next to the kitchen. No struggling to bring the groceries into the kitchen! And speaking of the garage...the walls are finished in drywall, and there is plenty of room for storage. The guest bathroom is conveniently located downstairs at the bottom staircase landing. 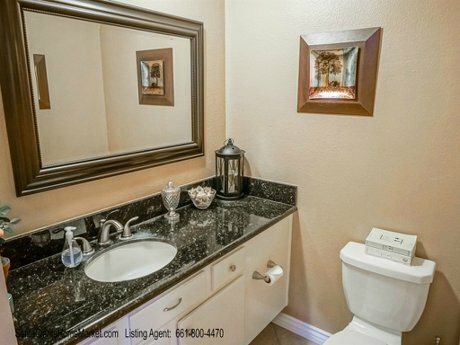 It features tile floors, a pedestal sink, decorative mirror and lighting. 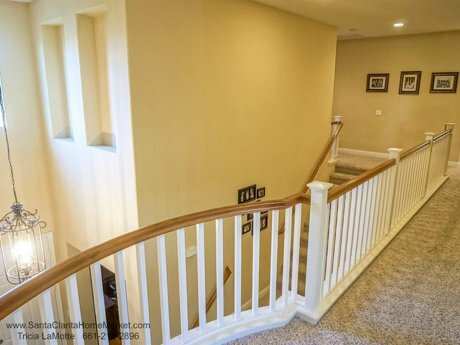 The upstairs landing is large enough to provide space for a computer station. The upgraded maple cabinets provide plenty of storage space. And the counter offers more convenience to the homeowner. 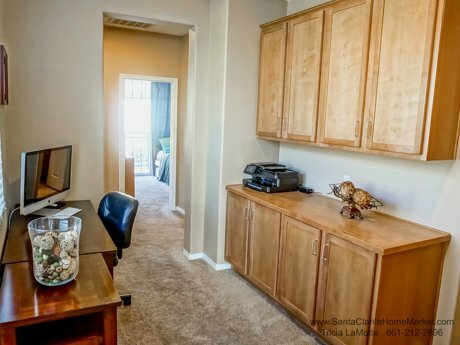 Consider this your work at home office space. 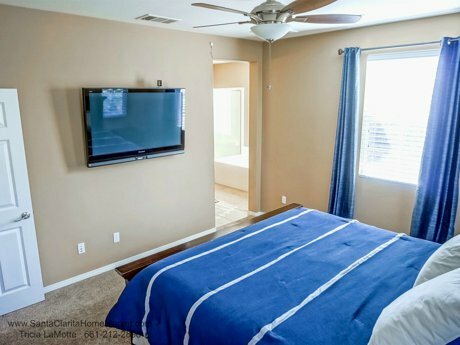 The master bedroom provides great natural light, a ceiling fan, and outlets for a flat screen TV. 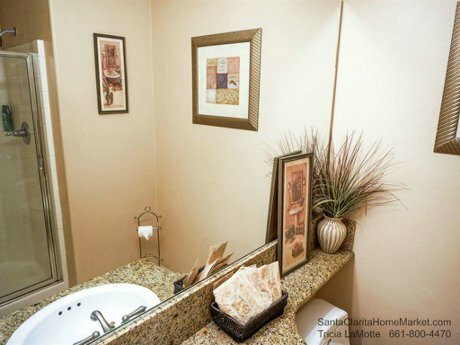 There is direct access to the spacious private master bathroom. 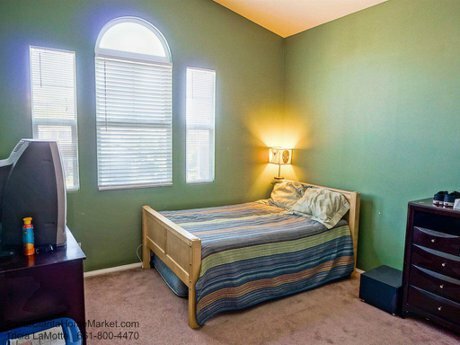 The upstairs bedroom all offer newer carpeting and blinds on the windows. 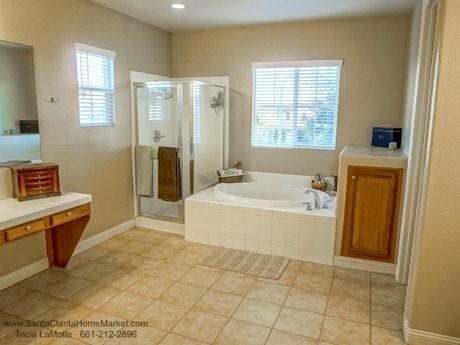 The master bathroom has tile floors for easy up keep; a separate shower with a seat and glass doors and separate tub. Private toilet closet with a window. Dual sinks with a large granite counter and maple cabinets. The walk in closet is large. The second bedroom upstairs has a sliding glass door leading to the balcony. There is a ceiling fan and mirrored closet doors. The third upstairs bedroom has a French door leading to the balcony. 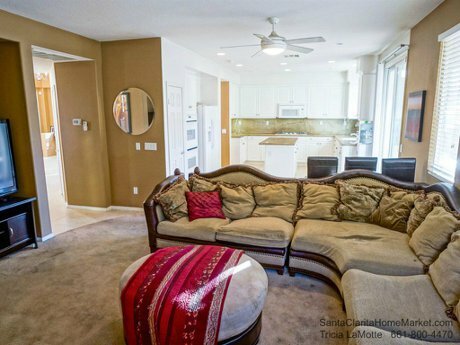 There is a ceiling fan, and mirrored closet doors. 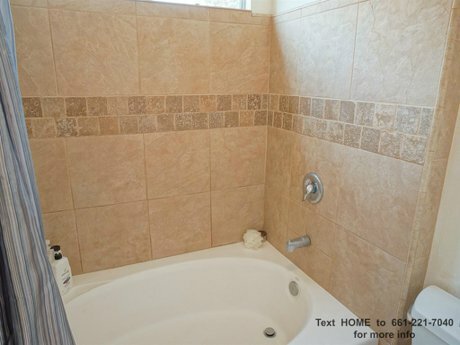 The upstairs hall bathroom has tile floors and a combination tub and shower. 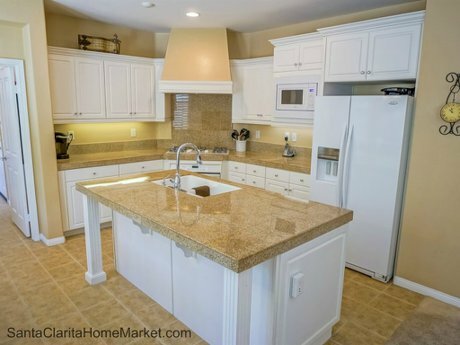 The dual sinks have a large granite counter and maple cabinets. Just across from the bathroom is the laundry room. Just the place you want it! The two car garage is a convenient traditional side by side style with a garage door opener and plenty of storage space. There is direct access into the home through the garage. The upstairs balcony can be seen in this photo. The West Creek Recreation Center has a resort like atmosphere, and will provide many enjoyable times for the residents and homeowners of the Esperto Collection! The West Creek Park has walking trails, sports courts and plenty of room for playing. 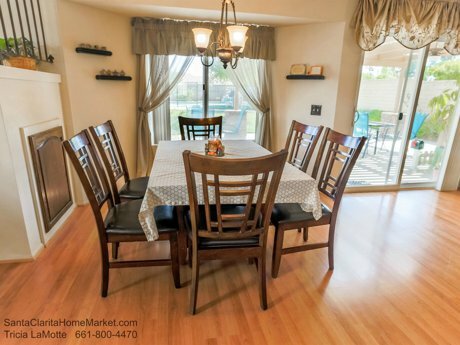 This beautiful turnkey 3 bedroom townhome with 2 1/2 bathrooms offers 1660 square feet of beautiful usable living space! The offer is attractively priced at $390,000. 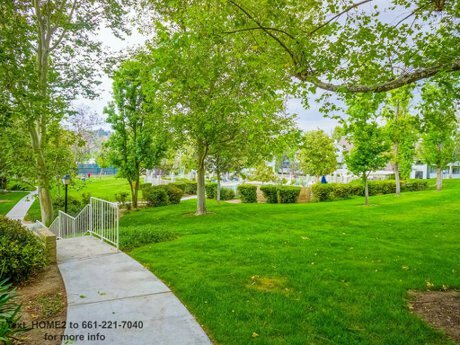 One of the special amenities of this neighborhood is proximity to the West Creek Academy, an exceptional elementary school, as well as Rio Norte Junior High School. 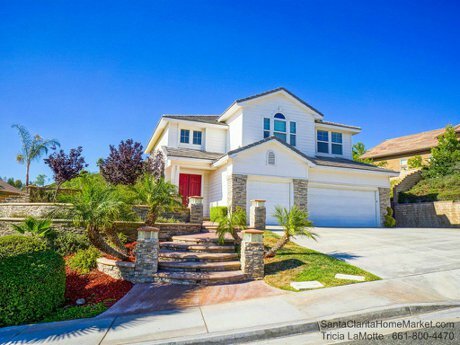 29337 Via Milagro, Santa Clarita, CA - For Sale Now! Have you outgrown your current 3 or 4 bedroom home? Additional family members on the way? 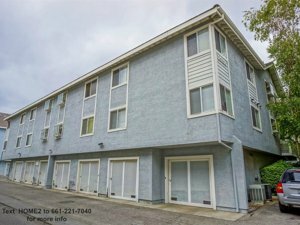 Relocating to Santa Clarita Valley? 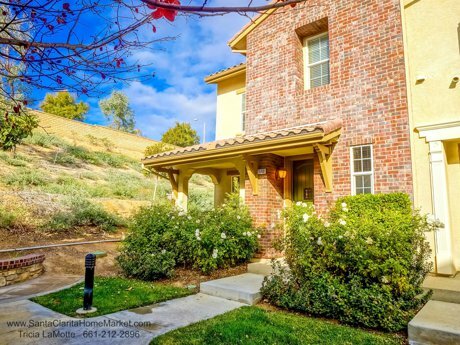 Whatever the reason you may have for thinking of purchasing a newer home in Tesoro del Valle, in the Valencia community of Santa Clarita this lovely 2 story home with over 3400 square feet of living space deserves your consideration. 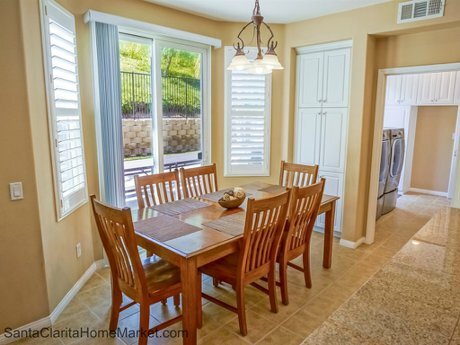 Take a Sneak Peak of this KB Home in Santa Clarita! 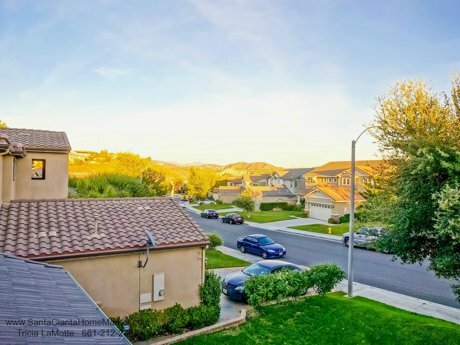 This beautiful 5 bedroom home is located in the sought after and very popular Tesoro del Valle, a master planned community in the Santa Clarita Valley which is approximately 40 miles north of downtown Los Angeles. 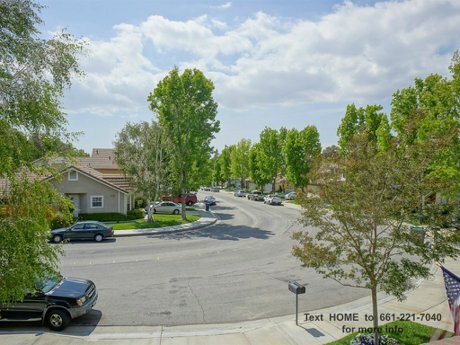 The tree lined neighborhood streets are beautifully landscaped, and there is an open feeling with views of the Santa Clarita Valley from many vantage points in Tesoro. nearby hills can be seen from this home's windows. 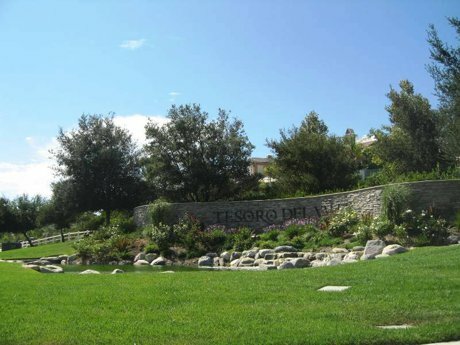 If you're looking for a resort feel to your new home, then Tesoro del Valle is the place! The large impressive clubhouse and it's wonderful facilities including the lake, swimming pools, sports courts, including tennis courts will offer something for every member of your household. 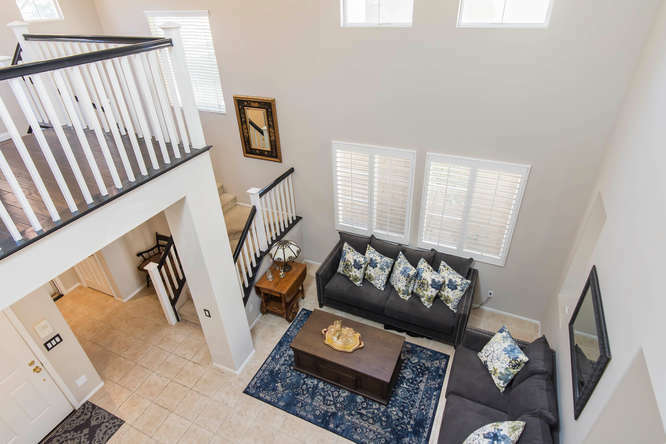 This spacious home built in 2003 by KB Homes, and is one of the homes in the Huntington Collection, a tract of homes in the master planned community of Tesoro del Valle, located in Valencia, CA 91354. The spacious home has 3437 square feet with a traditional flavor with a front porch, brick trim, front lawn and tree. Upon entering the double front doors, you will be impressed with the wide entry and soaring ceilings. The tile entry floor has a attractive mosaic inset. 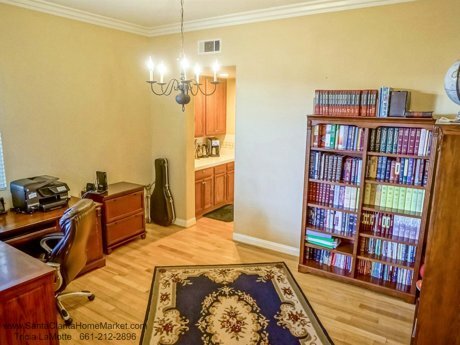 And to the right of the entry you will down step to a well lit large room that could serve as an office, library, music room, home study room...think of it as a multi-purpose bonus room. Versatile is the word for this room, and the wood floors and crown molding mean it will look beautiful no matter what furniture you place, or the function you choose. To the left of the entry step, you step down to the separate dining room. Some of the details include wood floors, crown molding, and a chandelier. The windows of this room look out to the front yard. The room is adjacent to the butler pantry, with convenient extra storage. This room is currently being used as an office; just another reminder of the flexibility of this floor plan. 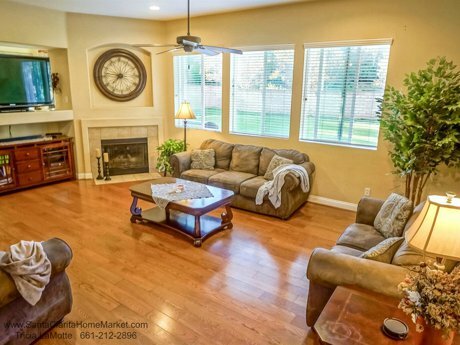 The living room features a cozy fireplace, ceiling fan, and wood floors. 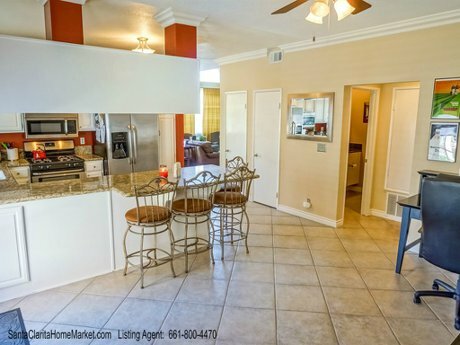 This beautiful big kitchen has plenty of counter space, with detailed tile, backsplash, plenty of cabinets and features newer stainless steel appliances, including 2 wide convection ovens, and a five burner cook top. A walk in pantry and an extra large storage closet provide plenty of food storage space for the large family. 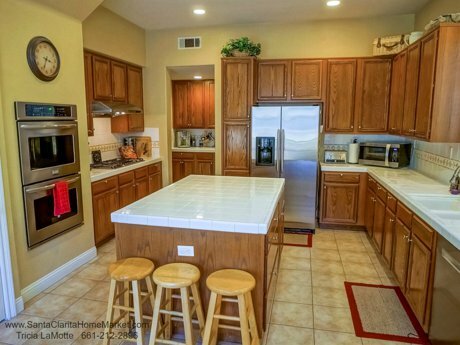 The large island and breakfast bar provide room for family and guests to gather in the kitchen. The adjacent room which is currently being used as a large dining area was actually intended by the builder to be a family room...and illustrates how wonderfully adaptable this floor plan is! 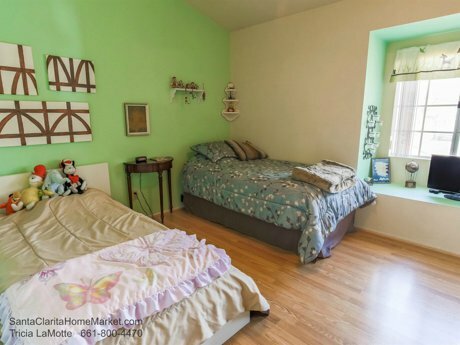 There is a downstairs 5th bedroom adjacent to the bathroom, convenient for guests, or a parent. 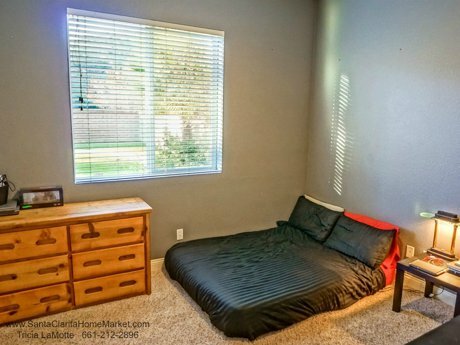 Those with knee problems will appreciate the convenience of this main floor bedroom. The downstairs bathroom has tile floors, and a combination shower and tub. The well lit extra wide staircase makes moving large furniture easy, and moving day will be much more pleasant! The large staircase landing is bright and cheerful and provides plenty of cabinets for linen storage. 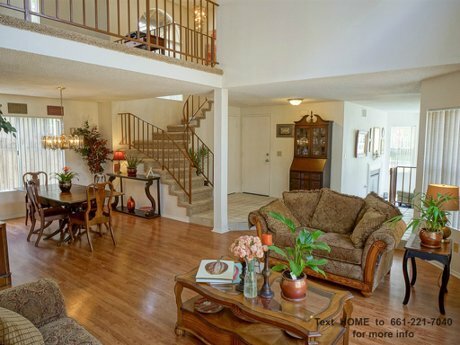 And with 4 bedrooms upstairs, you will appreciate this convenience! 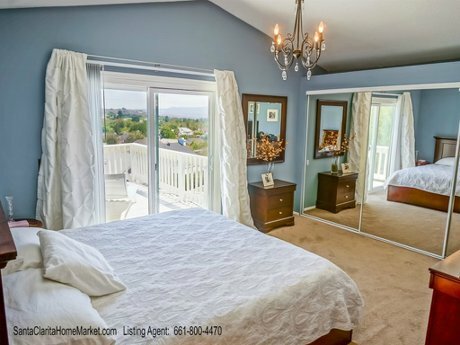 The large master bedroom has a view to the hills, and room for a sitting area. There is an impressive archway entry leading to the large master bathroom. 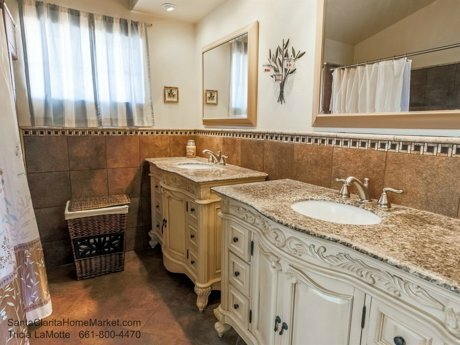 The master bathroom offers 2 separate sink areas with counter space, and a makeup area. 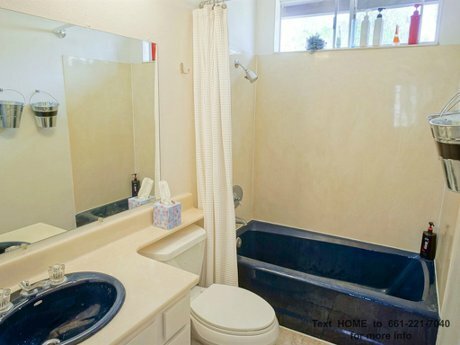 There is a soaking tub and separate shower. There is an extra large walk-in closet. 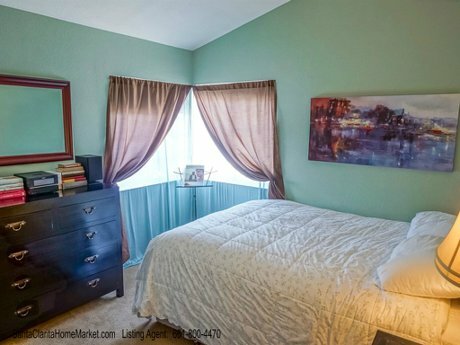 The second bedroom is extra large with newer carpeting, chair railing, ceiling fan, window blinds, and plenty of room for a desk or extra furniture. 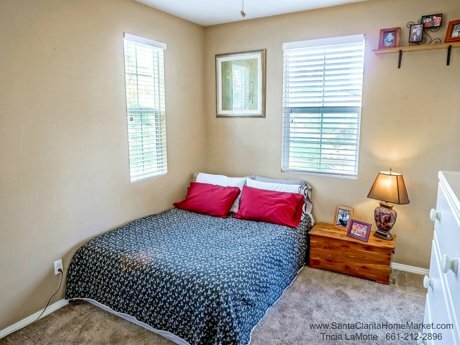 The third bedroom is roomy, and has window blinds, newer carpeting and recessed lights. The fourth bedroom upstairs is spacious and features newer carpet, ceiling fan, window blinds, and a view towards the landscaped hill. 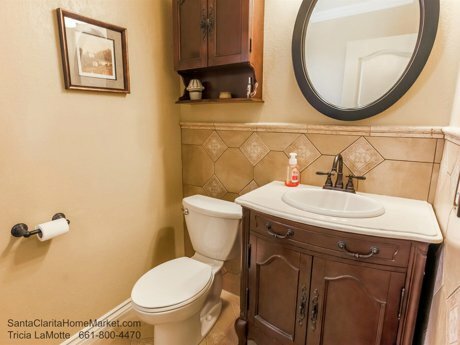 The upstairs second bathroom has a long counter with double sinks, tile floors, and a separate room for the toilet and clear glass enclosed combination tub and shower. 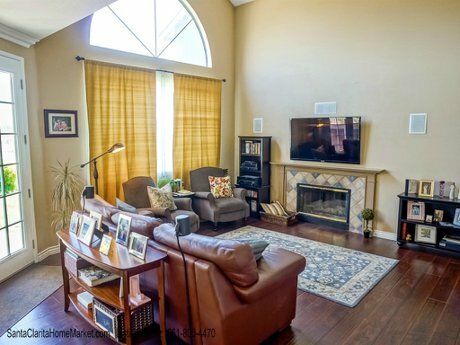 Throughout this lovely home are features that Valencia home buyers often look for, such as recessed lighting, wide baseboards, high ceilings, dual pane windows. 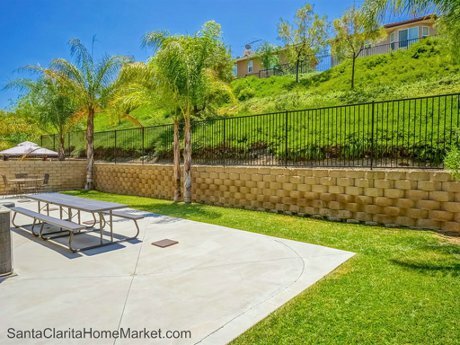 The large backyard of this home has a large lawn area with a concrete walkway all around it. This could be a a small track for walking or a skating or bike path for younger children. Imaginations are invited to play along! The patio has plenty of room for tables and chairs for dining outdoors, relaxing on your favorite chaise lounge. Backyard barbecues and dinner parties are sure to had in this backyard. And if you like the idea of having a swimming pool, and don't want to have to maintain the pool yourself...then the Tesro del Valle Clubhouse and swimming pools will definitely delight you! In fact, the Tesoro Recreation Center and Clubhouse will be your secret answer to wanting to be on vacation all year round, and never having to" leave home"! 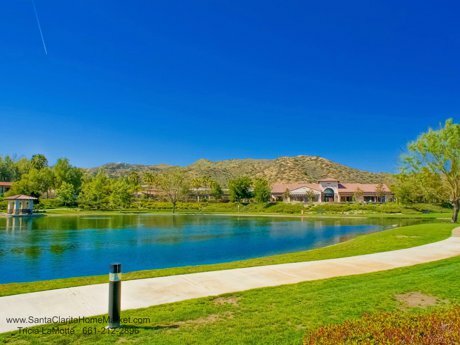 And, if you like the idea of Valencia lake side living...just go to the Recreation Center and relax or walk around the Tesoro Lake. Feel like playing a game of sand volley ball? Tennis courts practically in your own backyard? An Olympic type pool? Shoot some hoops? All this and more await you at the Tesoro Rec Center. What are you waiting for? 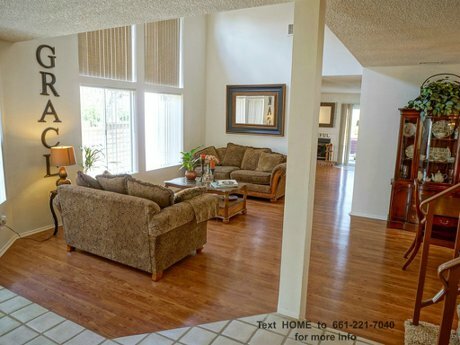 Come take a look for yourself...contact Tricia LaMotte 661-212-2896 for more information or to schedule a visit. The inventory in Valencia CA is low. This is the opportunity to learn more before this home appears in the MLS (Multiple Listing Service). 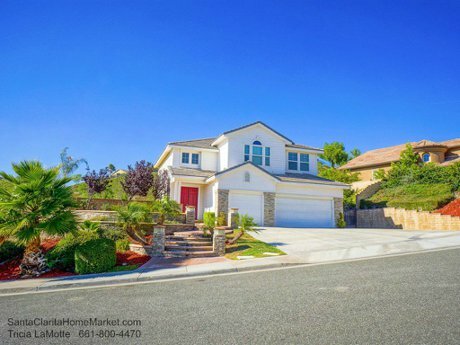 Lovely home for sale toward the top of the hill in the Canyon Country community of Santa Clarita, CA. 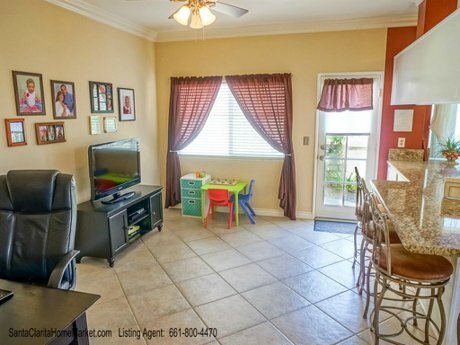 Situated on a child friendly cul-de-sac, this beautiful pool home has great curb appeal. The home has 1847 square feet of living space. 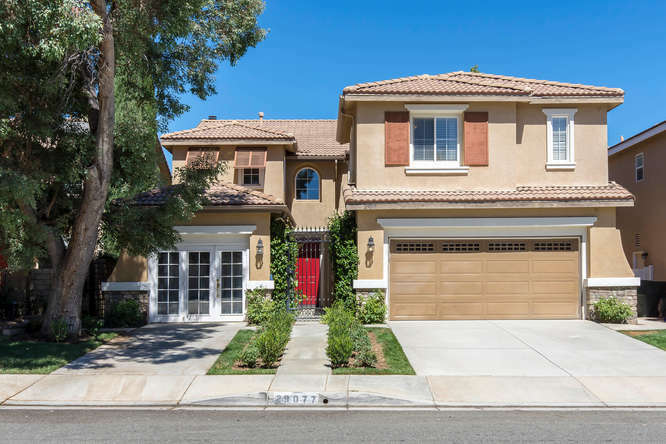 20434 Kesley Street is located in the established American Beauty Highlands II tract high above the Canyon Country community. The over 7200 square feet lot will provide lots of family enjoyment. 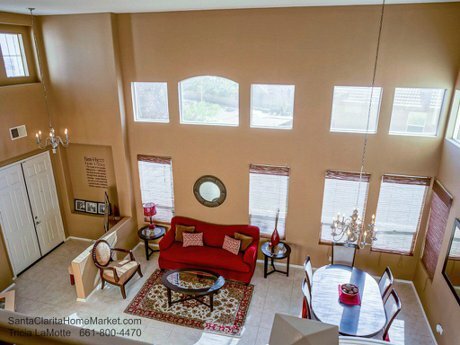 This 2 story home offers 1847 square feet of well planned living space. Downstairs is the well lit living room with higher ceilings and a bay window. Vertical blinds create privacy or filtered light, and the decorative drapes add a note of color to the room. 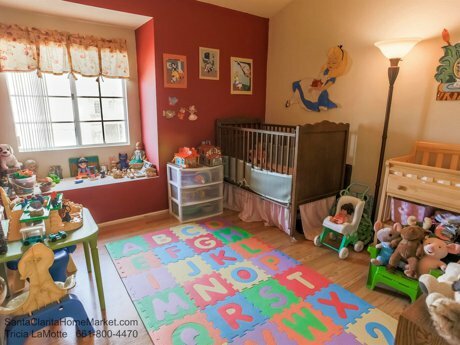 The floors throughout the downstairs are high quality laminated wood floors for easy care. The traditional fireplace with the wood mantle will be perfect for fall and winter cozy nights or romantic evenings. The dining room has corner windows which look out to the landscaped backyard with the inviting swimming pool and water fall. This room is large enough to add table leaves for large gatherings. perfect for up and coming holiday family and friends events! 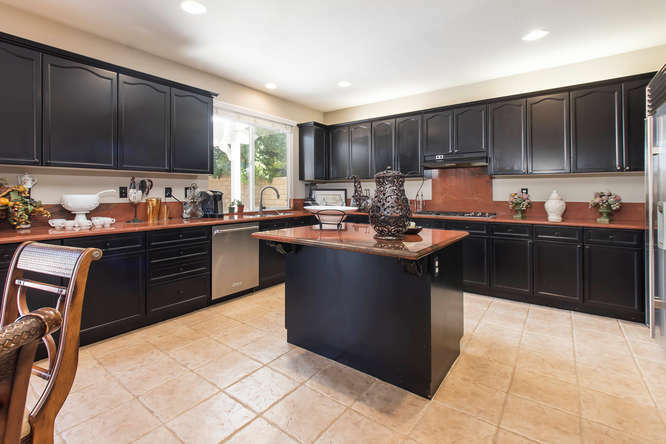 The kitchen of this attractive Santa Clarita home features a remodeled kitchen with custom oak cabinets with paneled doors and extra storage. Have your favorite cookbooks handy! The custom tiled back splash and tile counters, deep sink, pull out faucet with nickle finish bring enjoyment to the cook. The ceiling has an updated coffered ceiling with attractive decorative lighting. 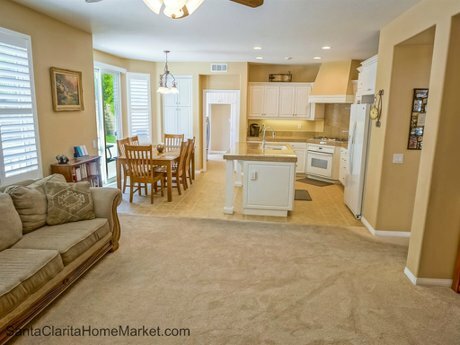 The informal dining area is adjacent to the kitchen and the family room. This provides a wonderful flow to the living areas. Plenty of windows provides light and the view of the backyard creates an indoor-outdoor feel, which further extends the living space. The staircase has wood steps and under the staircase storage. This well maintained home has so many well thought out upgrades. No need to have any carpets cleaned or collecting dust...a plus for any new homeowner that is concerned about allergies! 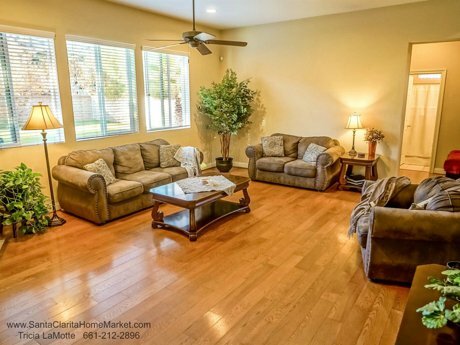 This home offers laminated wood, wood, and tile floors throughout. The family room has plenty of room for added furniture and the sliding dual pane glass door leads to the spacious covered patio, which beckons to come and enjoy the outdoors. 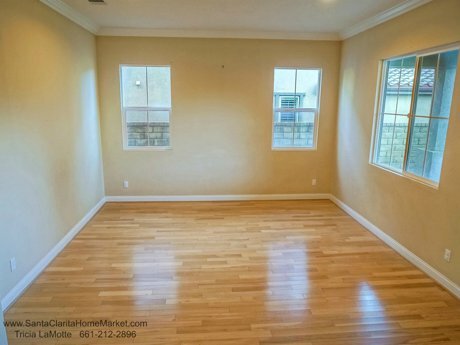 You can just imagine family and friends gathering here...because you'll have so much room! Beyond the paneled door is the indoor laundry, guest bath, and the door leading to the attached 2 car garage. The downstairs guest bathroom has been remodeled with custom cut tile floors and a portion of the walls with the same custom tile work. The beautiful vanity and appointments will make any guest feel welcome. And anyone working or playing in the garage - oh did we say "man cave"? - will have convenient access for a quick wash before going into the rest of the house. 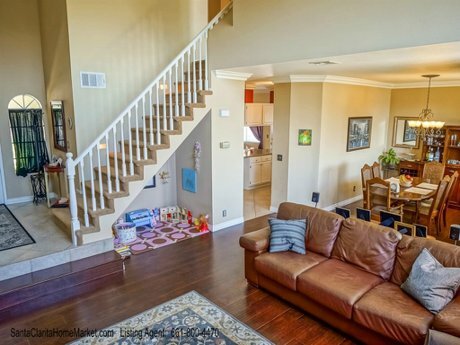 The wood stairs lead to the loft, which overlooks the living room, and has a view out the backyard. The corner windows provide a lot of natural light. The laminated wood floor is throughout the upstairs, and was installed over extra thick padding, so as to absorb sound. No detail was forgotten in this lovely home! 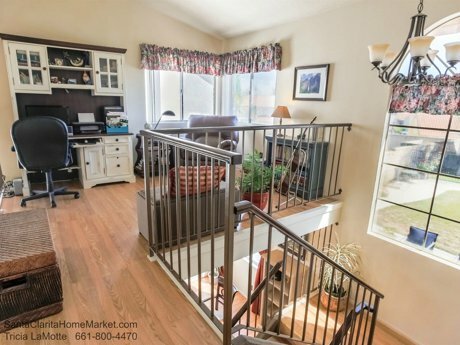 This loft area can be utilized for so many activities: the home office, extra family room, reading and home library, music room, home schooling, game room, a home gym. The list goes on and on. For more privacy...just add plantation shutters above the half wall that overlooks the living room...and voila! A more private area! 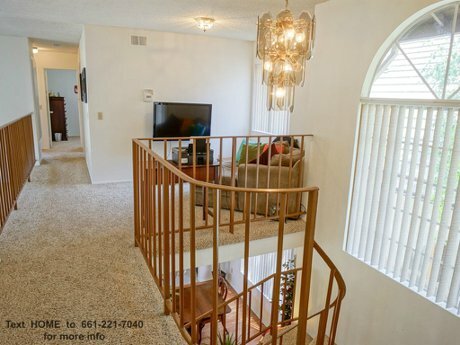 As you walk down the hallway, you notice the tall half circular window over the stairwell that brings your attention once again to the beautiful classic California backyard. Well, hold on...we'll be there in a moment! 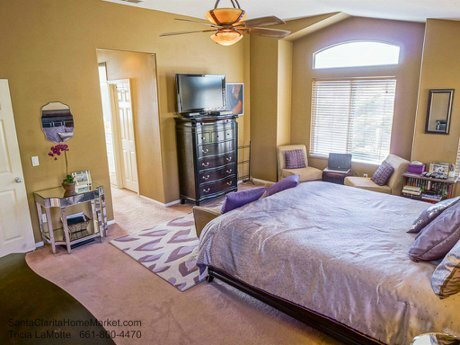 The master bedroom has high ceilings and a walk in closet. 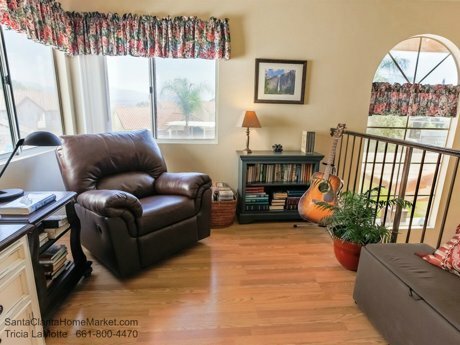 The window provides a view to the distant hills surrounding parts of Santa Clarita, as well as landscaped hills of the neighborhood. 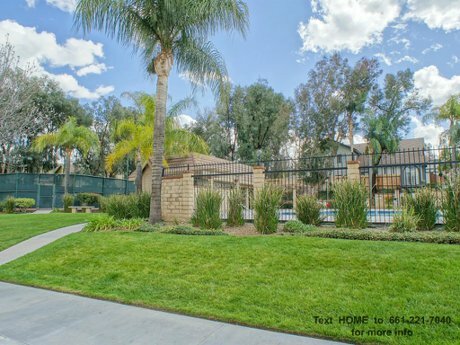 As you gaze down on your own spacious landscaped backyard with its fenced swimming pool, why...you almost feel like you're "king of the hill". And when you go through the space saving pocket door to the private master bathroom, you definitely feel as if you have arrived. 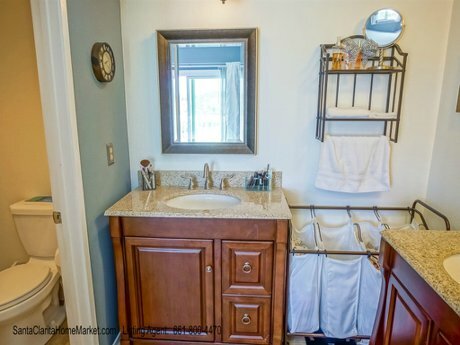 Separate vanities with granite counters and lots of storage...a true relationship saver! The tiled floors and tiled half walls with the decorative touches add to your contentment. The combination large tub and shower brings practicality to any morning ritual. The custom linen shelves add convenience to this well appointed master bathroom. The second bedroom has a window seat - oh the perfect spot for reading, gazing out the window at the distant hills and daydreaming, or perhaps something more practical...like extra storage space?? You decide. The closet has mirrored glass sliding doors, and an alcove above the closet for extra storage space or your favorite decorator items. 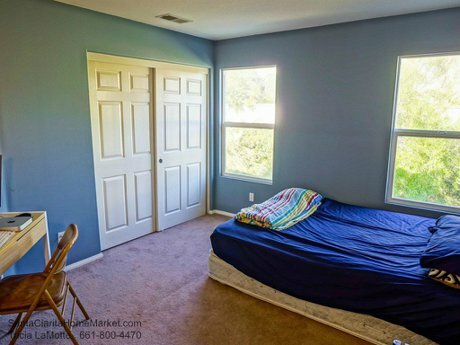 The third bedroom has high ceilings and a walk-in closet. And another window seat! A room big enough for people of ALL ages! 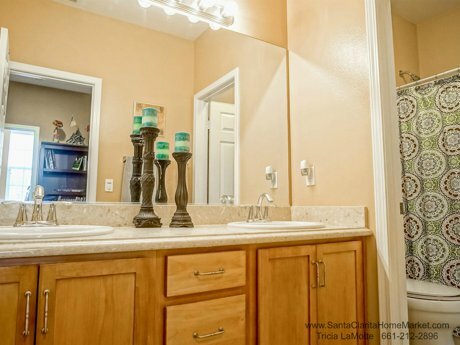 The remodeled upstairs bathroom features a granite topped vanity with a lovely decorative mirror, tile floors. The tiled combination tub and shower has a hotel style shower curtain rod, and niche for your favorite shower and hair products. Why go to a hotel when you can feel like you're on vacation right here at home?! 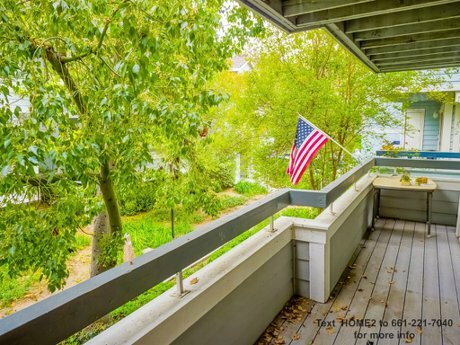 Now that you have had a tour of the interior of this beautiful American Beauty Highlands home with the ideal private location...it's time to check out the backyard! And how nice that you have plenty of patio space and a large grassy area between the house and the swimming pool! You definitely appreciate the fact that you don't feel like you will fall into the pool with so many houses you've seen that seem to be "all pool" in the backyard! Now notice the 3 ceiling "outdoor wet rated" fans and lights, the stacked slate pilasters. Imagine lovely evenings with your loved ones enjoying the outdoor lighting and gentle breezes. The large grass area provides the beginnings of many fun gatherings - whether to play games, like croquet, soccer, practice tumbling or somersaults. And notice the concrete walkway around the grass; perhaps your own private walking track (smile), or a tricycle track! Oh...think of the possibilities! California living at its best! The recently re-plastered and re-tiled free form swimming pool and water fall, which is situated within wrought iron fencing seems like a complete backyard itself. With the grass area for sun bathing, the gazebo ,and the private open feeling, this is like a yard within a yard. You appreciate the safety factor for any children. there is still plenty of room for activities and parties on the other side of the wrought iron fence! The backyard is surrounded with slumpstone walls for privacy. 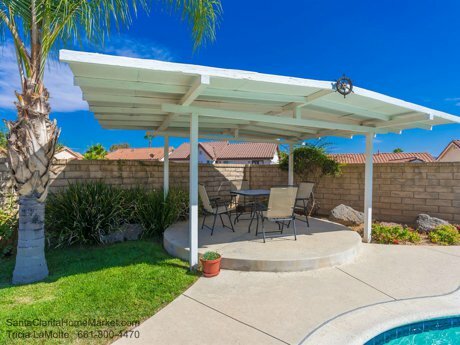 The poolside gazebo area brings another dimension to your own backyard. Yes, this feels more and more like a vacation! 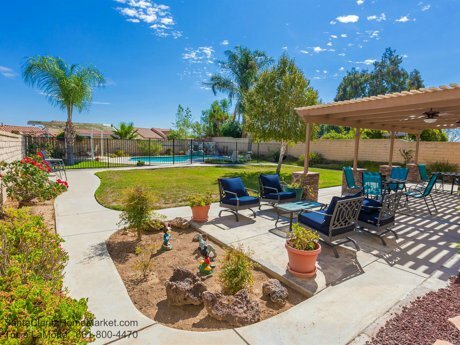 Whether it's morning spot for your coffee, a daytime lunch break, or evening dining alfresco, you just know, you will create many happy memories in this delightful backyard and beautiful home! In addition to all the backyard features previously mentioned, there is room for your favorite plants, flowers, succulents, or a small garden. And fall is the best time to plant those favorites! So just think...you can move in just in time to take advantage of the season! And did you know that Santa Clarita has gorgeous fall skies! 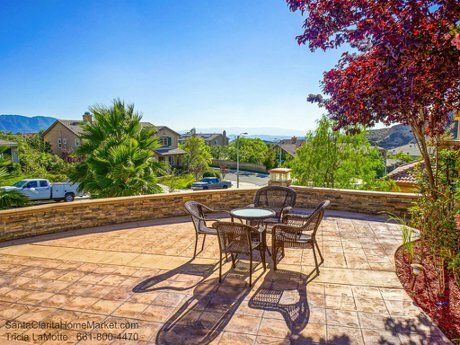 You have chosen the perfect time to buy a home in Santa Clarita, CA! 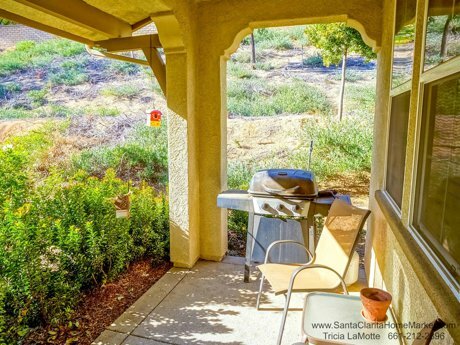 Contact Tricia LaMotte 661-800-4470 for more information and a private showing of this beautiful Canyon Country community home at the "top of the hill". In addition to all the features and benefits already mentioned to you, this home, with its great curb appeal, also offers the assurance and comfort of central air conditioning, copper re-piping, sprinkler systems, tile roof, the perfect cul-de-sac location, and the cost saving factor of no HOA dues or Mello Roos bond payments! You have searched high and low - from the top of the hill or in the valley...of Santa Clarita Valley, of course! You've worked hard to get where you are, and now you want a home that is away from the hustle and bustle of the "city"...oh, but not "too far". Just haven't found IT? You know, the type of home that tugs at you heart strings when you drive through a neighborhood, and you think to yourself, "Oh, I wish THAT house was for sale...I would love to live in THAT house". The kind of impressive entrance with steps and lighting and pilasters; you know...the one where you think "if they could only see me now!". Your search has led right here! And, of course, there is plenty of room for "them" to park. With the wide street frontage of this lot, there is plenty of street parking. Even better is the three car garage, the huge extra long driveway, and the wide and long side RV parking. Garage, driveway, and RV...oh my! Once you've decided where you want to park, you get out of the car and look around at the large impressive homes, and then you look out...and down...to the view of the distant hills...and feel like THIS would be a great place to unwind everyday. Walk up the concrete stamped steps with stacked slate trim and pilasters with the architectural lighting and specimen palm trees to the large front patio and take in the view. Imagine relaxing evenings here watching the sunset. The red front door welcomes you and you will feel as if good fortune awaits you! And of course, the view does not disappoint! 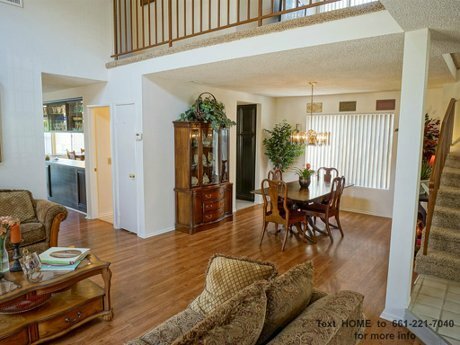 You notice that the lovely tiled floor living room and dining room have high ceilings, and lots of light. 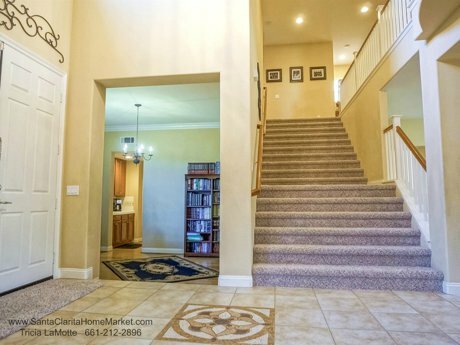 The sweeping staircase is the type you always wanted in order to make that grand entrance. And there is room for your favorite framed pictures, paintings, or art pieces. 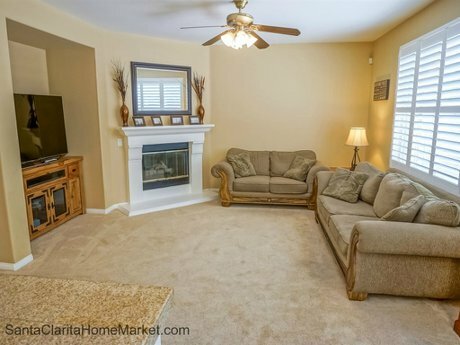 Santa Clarita View Home with Room for Entertaining! The rear kitchen and family room provide easy access to the spacious backyard where the prospect of entertaining with family and friends brings thoughts that this is the place to create those memories you've always wanted to make. 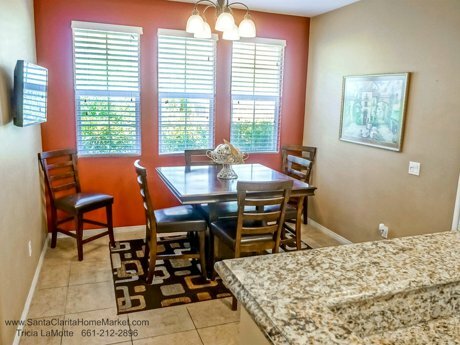 The kitchen looks like you could whip up a quick and convenient meal or make an unhurried culinary masterpiece...whatever your mood dictated. There is plenty of room for several cooks in the kitchen...you won't have to worry about "too many cooks in this kitchen"! Looking at the granite counter center island, you know that with the holidays on the horizon, you can put this kitchen to work making holiday cookies and treats, and other goodies. 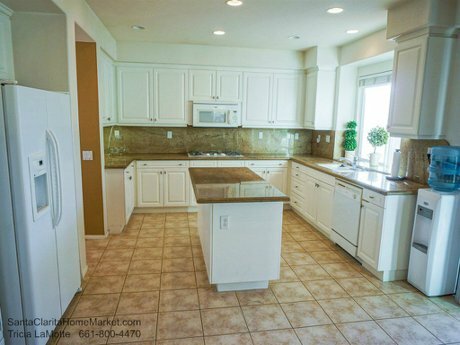 The ample counter space and cabinets have plenty of room to store kitchen cookware, appliances and other kitchen items. 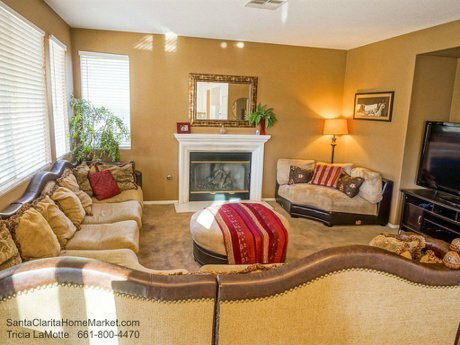 The adjacent family room has a cozy atmosphere with the fireplace and mantle. The corner windows look out to the spacious backyard. The extensive covered stamped concrete patio and overhead provide plenty of room for indoor - outdoor entertaining. Plenty of room for a crowd in this backyard! And the side yard provides another large area for play, a garden, or whatever you can think of. 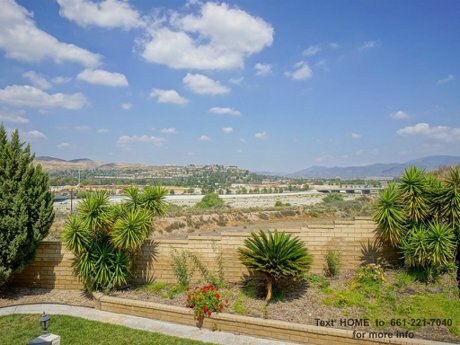 Not to mention it offers a view towards the southwestern Santa Clarita skies, and just another day in beautiful Southern California! 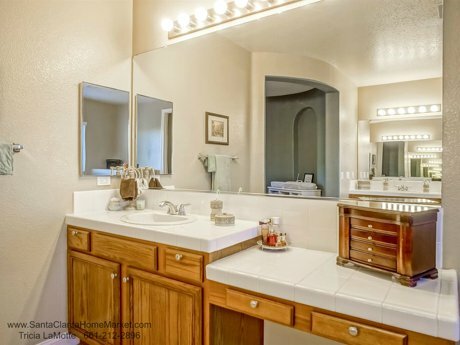 The Downstairs Bedroom and Bathroom Found in This Santa Clarita Home! Conveniently located downstairs in a large fifth bedroom and bathroom with a shower. 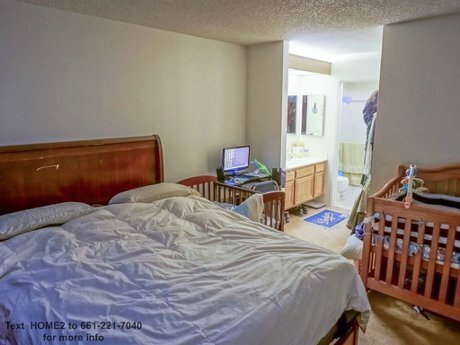 The perfect solution for the out of town guest, or a mother-in-law room. 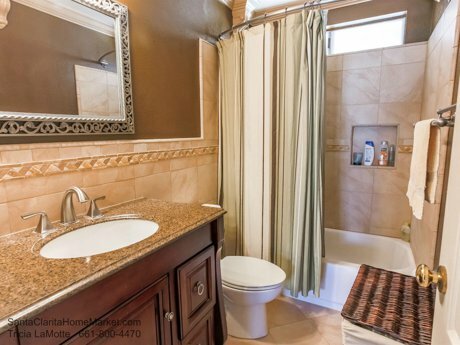 The bathroom features a granite counter, tile floors, and an easy to step in shower with a glass door. 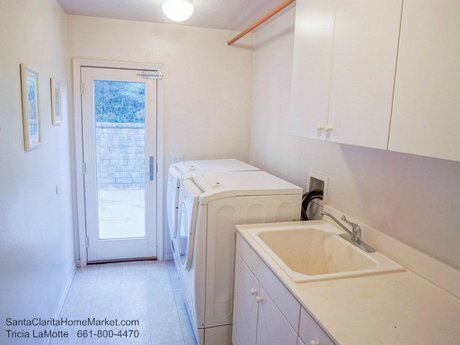 The indoor laundry is located downstairs across from the bathroom and has a convenient door to the side yard. Easy to come in from outside and go straight to clean up at the laundry tub or nearby bathroom. The counter makes it easy to fold clothes or do gift wrapping. 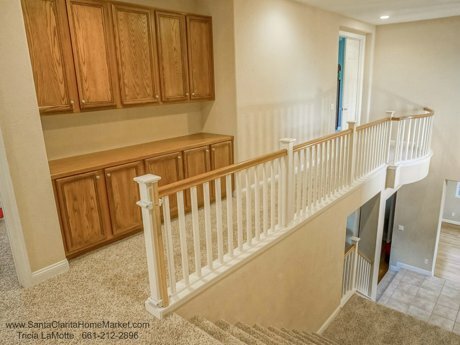 There is ample storage downstairs in the wide hallway with a large closet under the staircase. 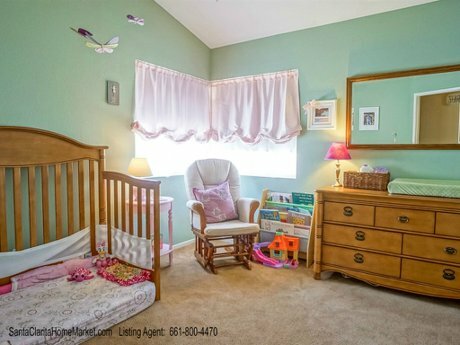 Hmm...what a great place for that secret children's playroom. You know, the kind you wanted as a kid! 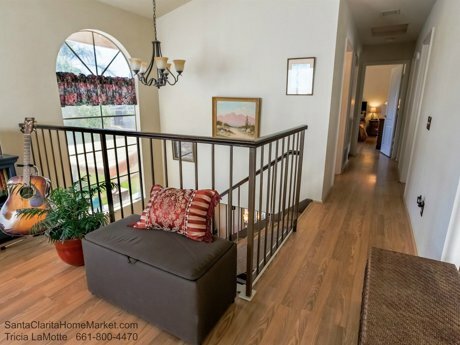 Once you have gone up the circular staircase you find yourself on a wide staircase landing and hallway with linen storage, and a view of the hills out the high living room windows. No dark hallways in this house! 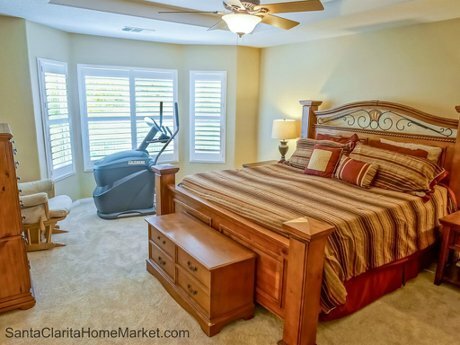 The master bedroom suite is toward the back of the house and has a view of the spacious yard, the landscaped hill, and the mountains in the distance. 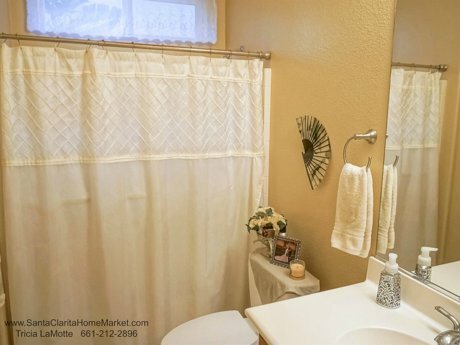 The large master bathroom offers tile floors for ease of cleaning, dual sinks with lots of counter space, a deep soaking tub, and separate shower. There are two walk in closets. The second bedroom is carpeted and has high ceiling with a large dome shaped window for detail. The third bedroom is also a good sized bedroom. 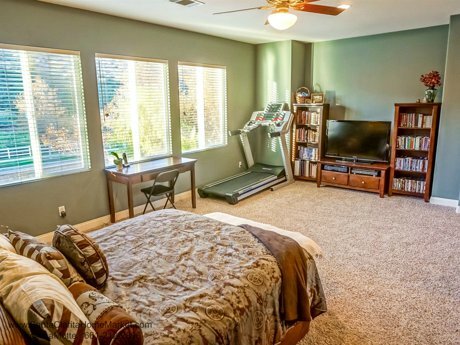 And isn't it great that bedrooms can be used for so many things like a gym, an office, an art studio, a game room, a children's play room, or??? The fourth bedroom is large, and has a closet with sliding paneled doors. The upstairs bathroom features a separate room for the tub/shower combination and toilet. The long granite counter provides dual sinks. This makes getting ready in the morning for school or work so much easier! Anybody remember "Mr. Blands Builds His Dream Home" with Cary Grant and Myrna Loy? Well, you won't have that problem here! Now that you have toured the backyard, it is time to check out the spacious backyard in earnest! 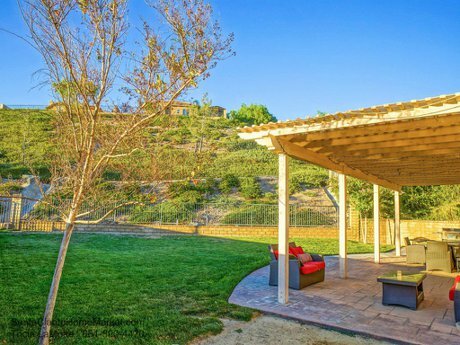 You can certainly imagine fun times in this yard and patio. The grass area is large. Perhaps a game of croquet, soccer practice for the kids, a place for a putting green for the golf player, room for a future pool or spa perhaps? Well you get the idea, this is a great area for so many things. And if you never do anything other than some somersaults and tumbles, or watch the dog scamper around on the grass, this will be an enjoyable area. Car or RV Enthusiast Need Apply Here! The 3 car garage and the large RV parking behind the double gate provide the perfect finishing touch for the car enthusiast. Why you could practically have fleet of cars parked here! And when you're ready to hit the open road in your RV, traveling those back roads and scenic places you long to see, you won't have to go far to get your RV ready! Because you can store it in your own yard! All in all this home on Wrangell in the Dakota tract in the Stone Crest neighborhood, is the place for you! And if you have been looking for a large 5 bedroom with RV parking, built since 2000, you know this is the only one on the market right now for under $949,900!! Is the price $900,000? NO! This beauty is priced at $650,000!!! Beautiful 3 Bedrooms, 3 Bathrooms, View, Spa, Possible RV Parking, Cul-De-Sac Location in Saugus - Now Sold! 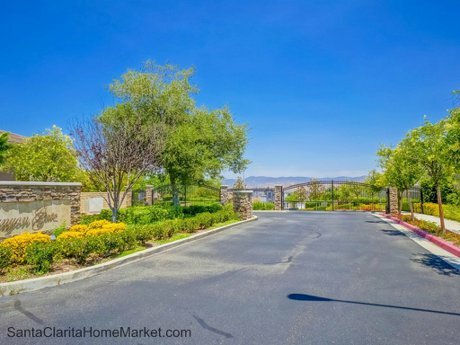 You've seen Santa Clarita homes that were perhaps disappointing because there was no place for your guests to park when they came to visit. You know the type of neighborhood I mean...the ones where the homes are built seemingly on top of each other, with no place to park. This is NOT that type of home! Contact Listing Agent - Tricia LaMotte - for info or private showing: 661-800-4470. You enjoy time with friends and family, and in this beautifully upgraded home you will be comfortable having them visit! Not only is there room for them to park, when they walk up the brick pathway to your front door, they will admire the beautiful plants that greet them. The front covered porch feels like you are walking into a Pottery Barn catalog. The tile interior entryway is practical and makes a nice transition to the step down living area. 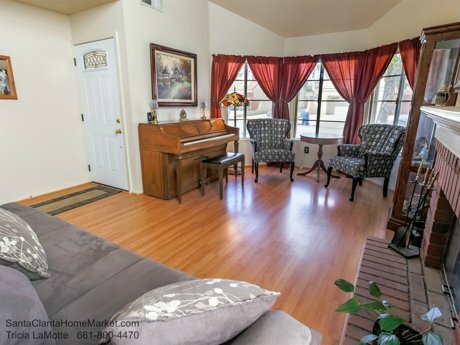 The high ceiling living room of this lovely Mountain View Cottage home has wood floors and is well lit with high windows that look out on the backyard and the view. And for the entertainment lover, there are built-in speakers for movie watching or music listening. The fireplace provides atmosphere. 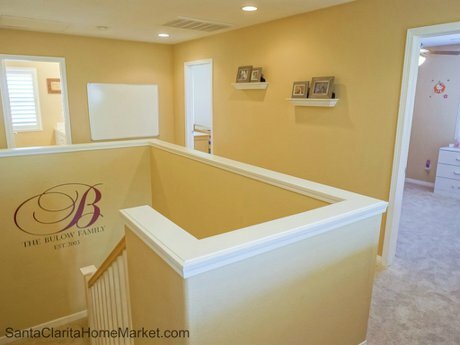 Under the staircase is the perfect niche area - the secret hideaway for kid's toys, the desk for creating the next "American Novel", a spot to play a game, read a book, store your favorite things, or even create the perfect built-in cabinet to keep your stuff out of sight. The dining room has plenty of room for a table that can extensions for those occasions when you are entertaining more than 6 people. The crown molding, wider baseboards, chandelier, wood floors, warm paint colors on the walls, and French door leading to the patio provide a note of sophistication. The kitchen will be a delight to create your culinary masterpieces for your guests,;or bring the take-out and spread it out on the granite counters! The stainless steel appliances and white wood cabinets are a beautiful complement to the gray tones of the granite counters. Adjoining the kitchen is the multi-purpose family room. The well thought out floor plan has two living spaces, giving all family members some needed space for various activities. The side patio is reached through the French door in the family room. 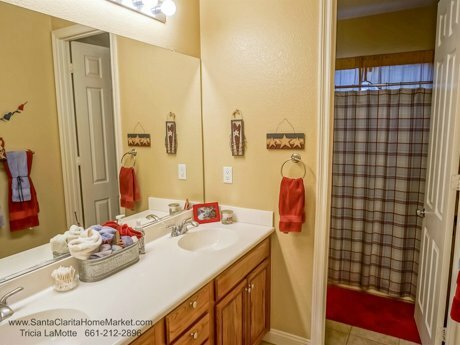 And conveniently located in the hallway near the family room is the downstairs guest bathroom, the laundry room, and the door leading to the attached two car garage. Upstairs three good sized bedrooms await you, and two updated bathrooms. 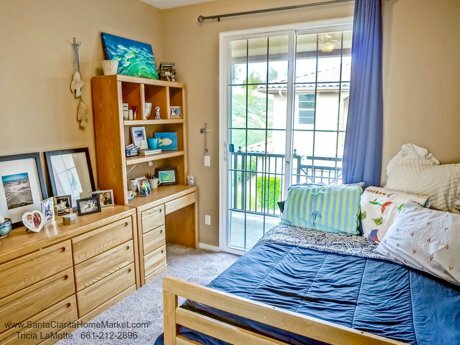 The master bedroom is a delight, with the sliding glass doors leading to the wood deck which over looks the backyard and a portion of Santa Clarita. 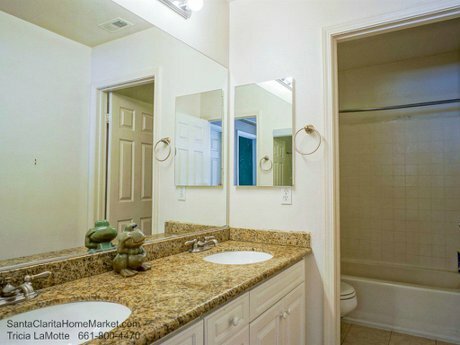 The master bathroom has two modern stand alone sinks, with additional room for a piece of furniture. You want a "traditional home"...the kind that actually has a front yard, a driveway, street parking, and hey, maybe even extra space on the driveway for additional parking, and perhaps possibly even RV parking on the side of the house! 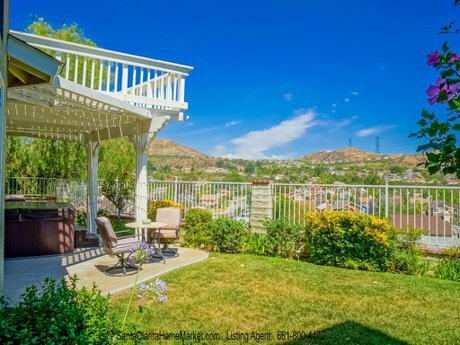 No, you're not dreaming...that kind of house exists under $500,000...and in a beautiful Santa Clarita neighborhood in the "North Copperhill Area" of Saugus, nestled in the hills with an outstanding view! 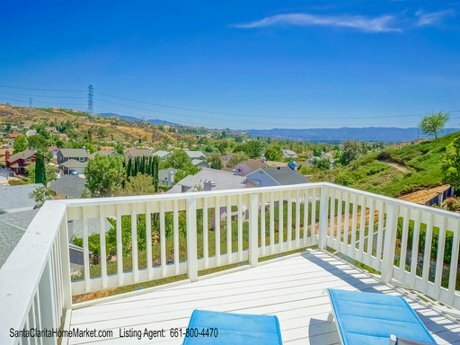 While we're talking views...imagine waking up and being able to slip out on your deck and view the surrounding hills and homes below, while you sip your morning coffee. Why, being on "top of the hill" is a great way to energize you for your day ahead! It's those early morning contemplative moments before you start the day, listening to the morning birds sing their songs, viewing the trees below, and the hills off in the distance that make you appreciate where you live. 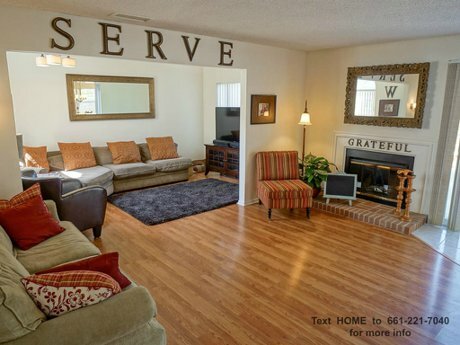 And live you do...in this beautiful 3 bedroom two story home in the Saugus community of Santa Clarita Valley. This lovely home is ideally situated at the end of a short cul-de-sac - just the kind of street you may look for if you have children, and want to avail a "through street", or you just like the idea that there won't be cars racing past your house. And this home is uniquely situated on the lot to not only take advantage of the view, but also to have extra parking in the driveway and possible parking space for an RV or boat on the side. 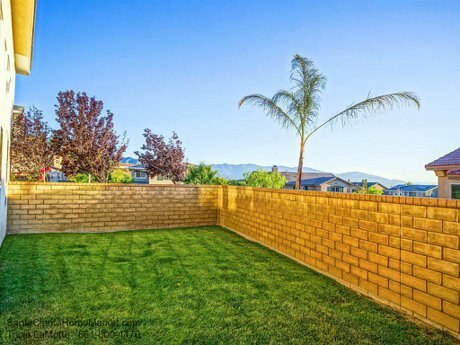 And if you don't need the space for RV parking - which is a premium in Santa Clarita, this extra wide side yard is great for so many things! Like extra room for play, a patio for dining, a garden, more planting space, etc. 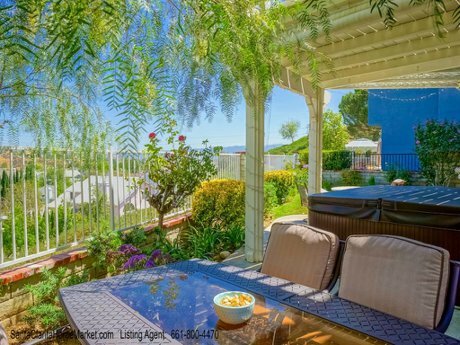 The backyard beckons you to come out and enjoy the view. And this backyard boasts not only a grassy area, but a covered patio area, a newer above ground spa, and a patio dining area. The spa allows you to enjoy peaceful evenings looking out over the neighborhood, with twinkling lights, and sun kissed hills in the distance. The overhead is a a perfect place to string decorative lights for a festive and romantic evening mood. This desirable neighborhood has no HOA dues and no Mello Roos. This is the kind of neighborhood so many savvy home buyers look for since there are no additional fees to the normal mortgage payment, property taxes, and property insurance. 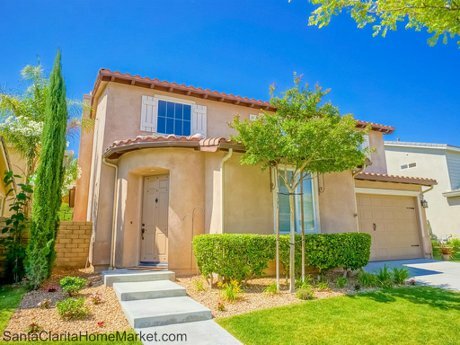 Santa Clarita - the Place to Live! 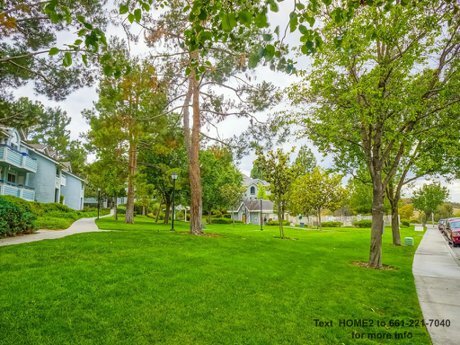 This beautiful home located at 22805 Acacia Court located in the Mountain View Cottages is located in the city of Santa Clarita, one of the safest cities in the United States among cities with a population of over 100,000. In fact, with a population of over 200,000, Santa Clarita would probably rank at the very top! 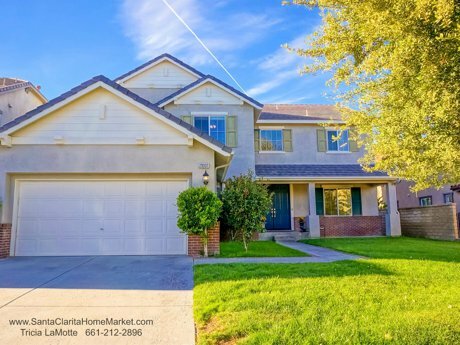 Santa Clarita has much to offer residents with excellent Distinguished Schools, parks, recreations, bike trails, walking paths, shopping, restaurants, state of the art entertainment, live theater, movie, theaters, and so much more. Contact Listing Agent - Tricia LaMotte - for private showing: 661-800-4470. 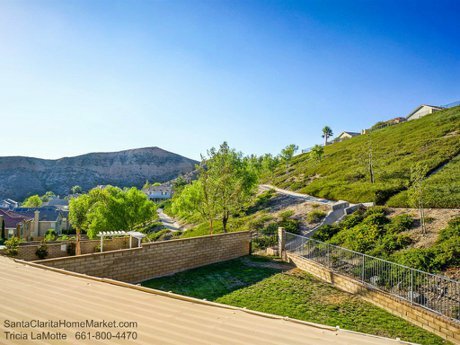 19704 Ellis Henry Ct Santa Clarita CA 91321 - Sold! 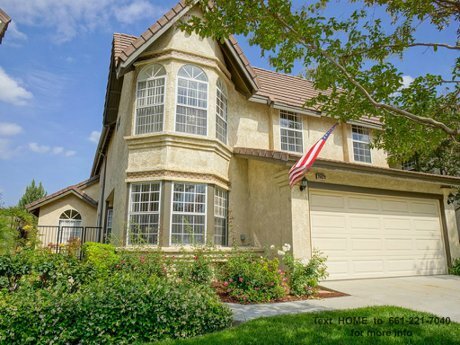 This beautiful move in ready home in the gated community of Canyon Gate in Santa Clarita is coming on the market soon. Now is your opportunity to purchase the perfect 4 bedroom two story home with a downstairs office. 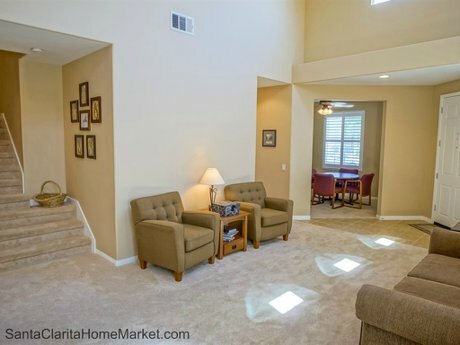 This over 2500 square feet home, priced at $549,000 will delight the Santa Clarita home buyer. 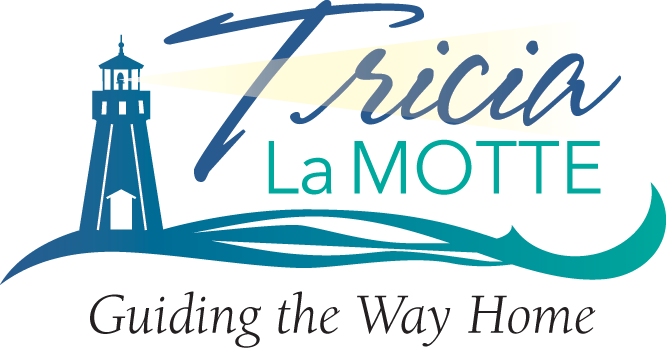 Call or Text Tricia LaMotte 661-212-2896. 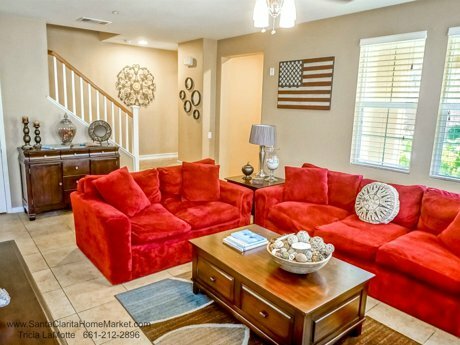 Imagine finding that home you've been searching for...Canyon Gate was built in 2005, and is a gated community offering the residents and homeowners an attractive clubhouse, swimming pool, spa, and barbecue area. 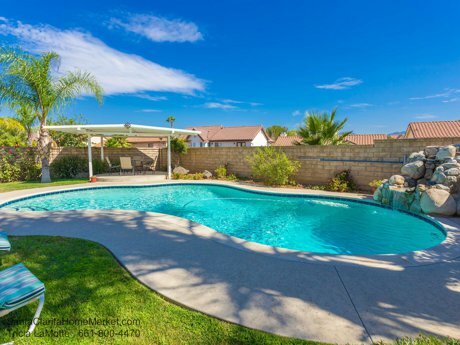 This is an ideal situation if you are a home buyer wanting the benefits of a nearby private neighborhood swimming, but don't want the expense and the upkeep of maintaining your own pool. And you'll have a chance to meet and know more of your neighbors this way! 19704 Ellis Henry Court has been well maintained, and once you walk through the front doors with the custom detailing, you will feel like you have arrived home! The entry way is tile, and makes a great transition into the living room. You'll want to take your shoes off, because once your toes touch the luxurious high grade carpet you'll feel the stress of any work day melt away. The high ceiling in the living room and dining area and the high windows flood the rooms with natural light, and bring a smile to your face. The rooms are spacious, the walls are softly colored, and the windows all have beautiful white plantation shutters. 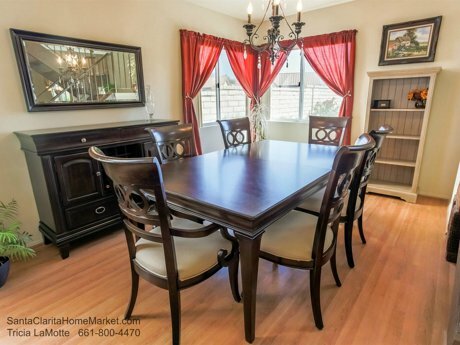 This home is definitely a wonderful backdrop for any furniture, artwork, and decorative furnishings you have. There is a downstairs office and guest bathroom. 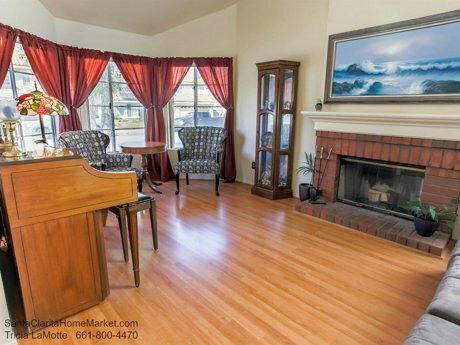 The office is open to the living room and can serve so many purposes, for instance, a music room; I recently had a home buyer looking for a home with a place to put a piano...this would be a great place for that! Or a library for the avid reader or writer...yes, there are still some people who like to read and write...even though they are tech geeks! A place for children to do their homework and study. And, of course, an office! 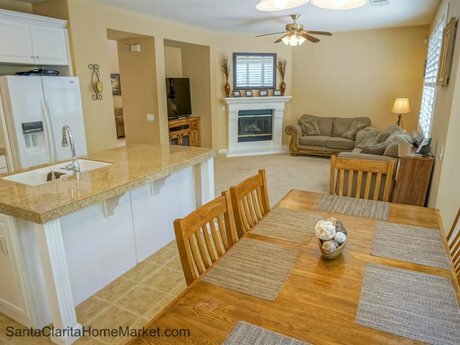 The family room is adjacent to the large kitchen and breakfast area, and features a fireplace. The bank of plantation shuttered windows looking out to the backyard provide controlled lighting and are beautiful to look at. 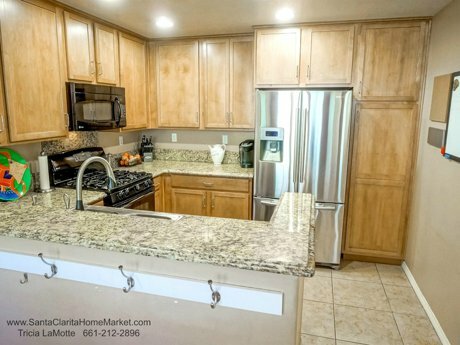 The large kitchen has plenty of counter space, cabinets, and a large center island to give any cook or non-cook room to work. And the stove hood adds a distinctive visual focus to the corner of the kitchen. 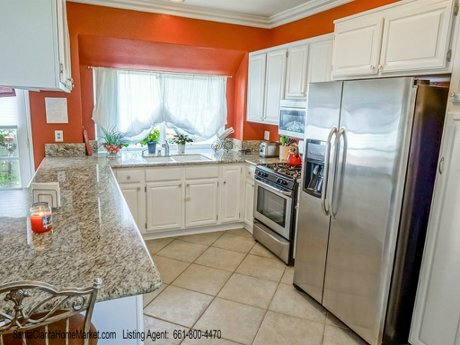 the granite counters complement the cabinets and the tile floors. The downstairs laundry room provides plenty of room for the most modern washers and dryers, and has added custom cabinets and storage area. 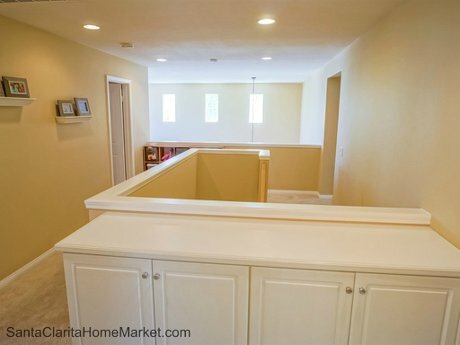 The three car garage is accessed through the laundry, making it very convenient to bring groceries into the house when you've done your marketing. The backyard can also be accessed through the laundry room. 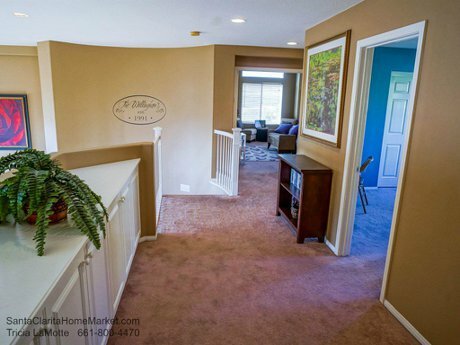 This is great transition into the rest of the home, making it easier to keep carpeting clean. 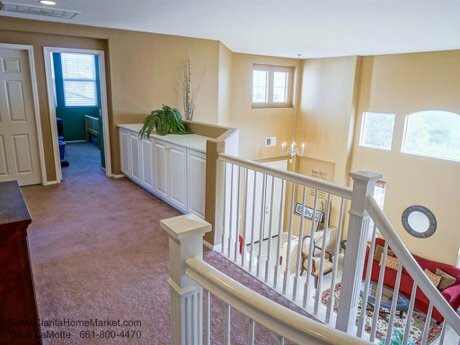 The wide split landing staircase leads to the four bedroom upstairs. There is an open and light feeling upstairs due to the design of the bedrooms situated around the staircase, and the staircase landing being open to the downstairs and the high windows. All of the bedrooms are large in size, and all have plantation shutters on the windows, which, again, makes it easy to control the light. Day sleepers or those who like a darkened room for sleeping will rejoice! 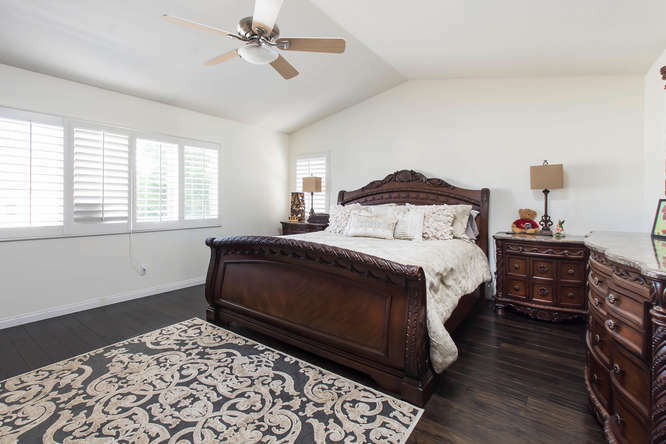 The master bedroom suite is large, and has a coffered ceiling with a ceiling fan, making sleep comfortable on warm nights, and saving on your electric bills. There is usually a nice breeze on summer evenings in Santa Clarita, so open windows is pleasant. 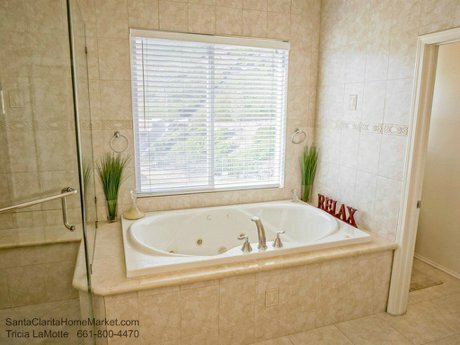 The master bathroom offers a deep jetted spa tub for relaxing, and a separate shower. 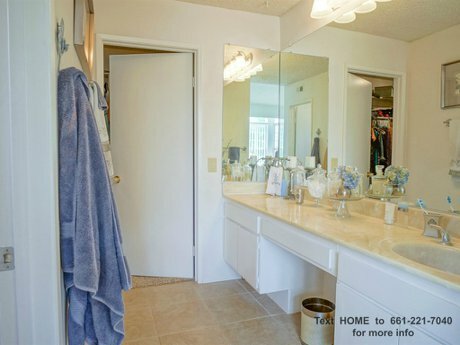 There are dual sinks, and plenty of room in the walk-in closet. 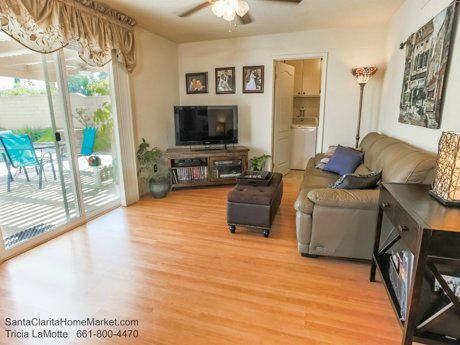 This lovely home has plenty of closets and storage throughout. There is no Mello Roos. The 14 Freeway is easily accessed for the commuter, and there is nearby shopping at the Golden Valley Shopping Center. And of course, all the shopping found in Santa Clarita, such as the Westfield Valencia Town Center Mall is just a short drive. 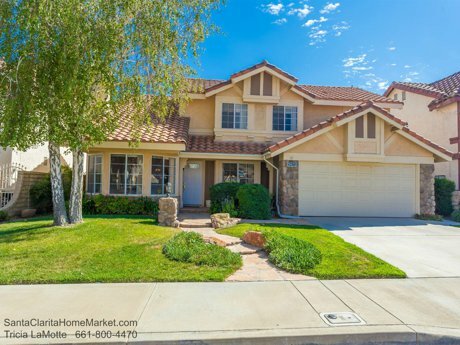 Santa Clarita is one of the most sought after cities in the Los Angeles area. The city of Santa Clarita consists of the various communities of Valencia, Saugus, Canyon Country, and Newhall; the city is located within Santa Clarita Valley, which also contains the communities of Stevenson Ranch, Valencia Westridge, and Castaic - which are all in the unincorporated area of Los Angeles County. It is located about 38 miles north of downtown LA. The transportation is varied - with the Santa Clarita Transit System, the Interstate 5 Freeway, nearby Highway 14, and the Metro; making it easy to get to work, entertainment, and events in the greater Los Angeles area. The city of Santa Clarita is one of the safest in the U.S. with populations having over 100,000 residents. And even though Santa Clarita now has over 200,000 residents, in some ways it still has a small town feel. For instance, the annual 4th of July Parade brings hundreds of locals to the streets in Newhall and Valencia to witness, cheer, and raise American flags in celebration of our nation's freedom. The Santa Clarita 4th of July Parade is a time to visit with neighbors, friends, while watching school children, veterans, marching bands, horse riders, local businesses come out to participate. 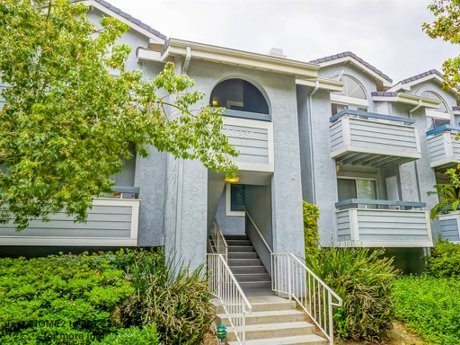 A 3 bedroom, 2 bathroom condo centrally located in the beautiful city of Santa Clarita, CA, just 38 miles north of downtown Los Angeles. Great opportunity for a first time home owner, or an investor that would like to have a long term tenant who would like to remain as a renter. 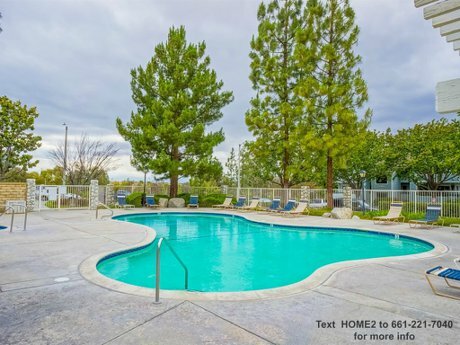 This one level condo is located in a community that offers many amenities such as a number of swimming pools, spas, tennis courts, greenbelt area, and beautiful landscaping throughout the complex. 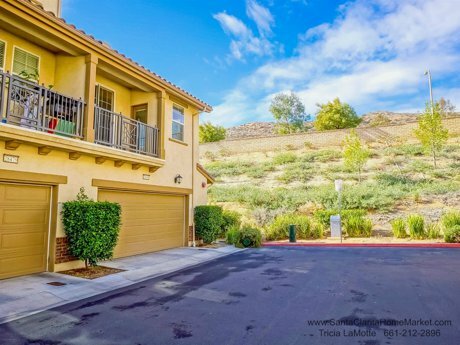 This Canyon Country condo has a two car garage with room for storage. The garage is accessed down a small flight of stairs from the front door. The well lit living room offers a fireplace for added atmosphere and architectural detail. 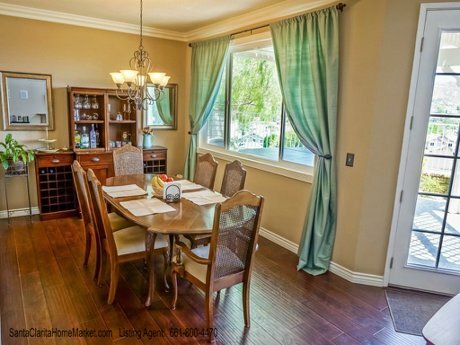 The dining room is adjacent to the living room, and has a sliding glass door to the private balcony. The kitchen has a garden window with room to grow those special herbs for creating your own gourmet meals in your kitchen. There is a breakfast bar for convenient quick morning meals before heading off to your day. 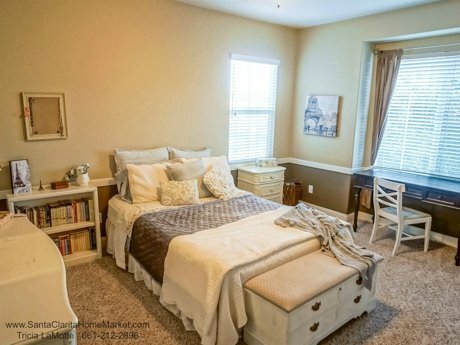 The master bedroom has its own bathroom with an extra large shower, and walk in closet. The laundry area is conveniently located off of the main hallway. 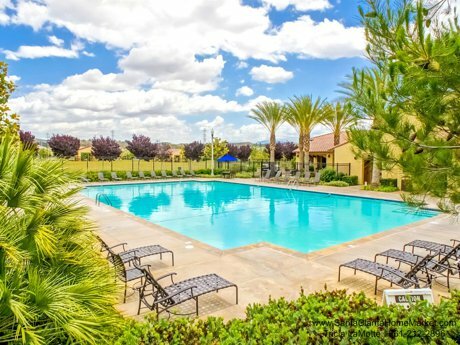 American Beauty Village has easy freeway access, and is near transportation, including Santa Clarita city buses, the Metro station for travel to the San Fernando Valley and downtown Los Angeles. 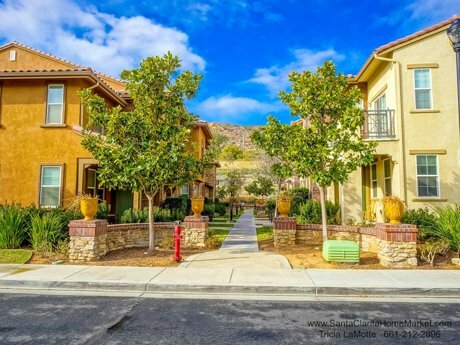 The communities of Valencia, Saugus, and Newhall - also located in the city of Santa Clarita - are near to the American Beauty Village Condominiums in Canyon Country. There is near shopping, theaters, restaurants. No Mello Roos. Relocating from out of the area and you would love to find a beautiful home that you can buy now at today's prices and interest rate...but not move in until next year? 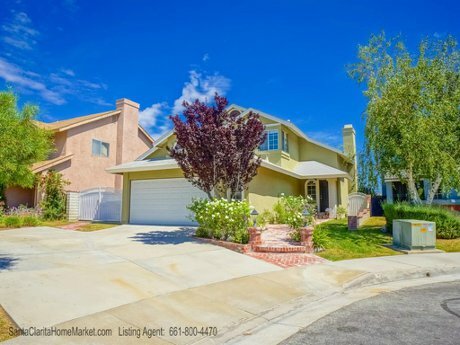 Here's you opportunity to purchase a lovely 4 bedroom Canyon Country home that is centrally located in the city of Santa Clarita, CA....and for under $500,000! 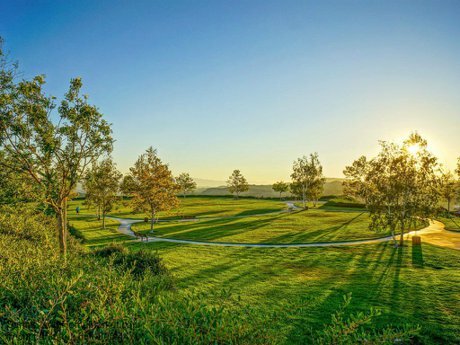 Santa Clarita, a Tree City, is one of the best suburbs in Los Angeles County, and being only 38 miles north of downtown Los Angeles, has so much to offer in addition to all the Southern California attractions. Santa Clarita is one of the safest cities of over 100,000 population in the United States. 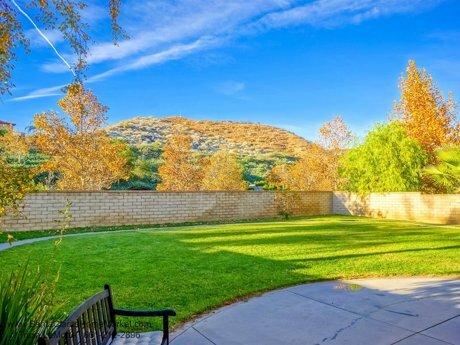 With great schools, three colleges, beautiful views, bike trails, hiking trails, master planned communities, shopping, good transportation, beautiful skies, entertainment, and a plethora of restaurants and eateries...it is no wonder that Santa Clarita Valley is a desirable place place to relocate. Within an hour or less drive you can enjoy the beaches, mountains, deserts, the bustle of Los Angeles, visit world class museums, art galleries, and so much more! 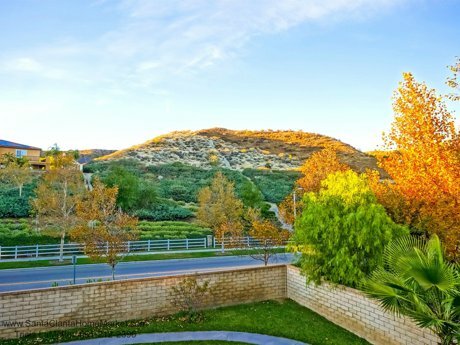 LA may be "the place to be"...but Santa Clarita is where you want LIVE! 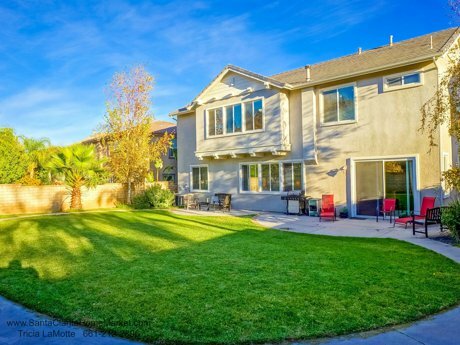 26828 Madigan Dr, Canyon Country, CA 91351 is located in the American Beauty Classics, and is centrally located in the city of Santa Clarita. The neighborhood offers a number of swimming pools, spas, play areas, tennis courts, basketball courts. And even though it has convenient freeway access, it seems tucked away and off the "beaten bath", so it is a serene neighborhood. 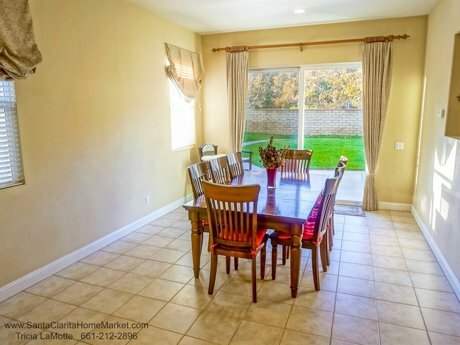 This beautiful 4 bedroom, 3 bathroom Santa Clarita home is especially located well, with a minimum of homes being in close proximity, which offers the interior of this home with plenty of light. And since there are no rear neighbors, there is an open feeling, and a view of the distant hills from the upstairs windows. You can enjoy your own backyard with no one "peaking down on you" from a rear neighbor. 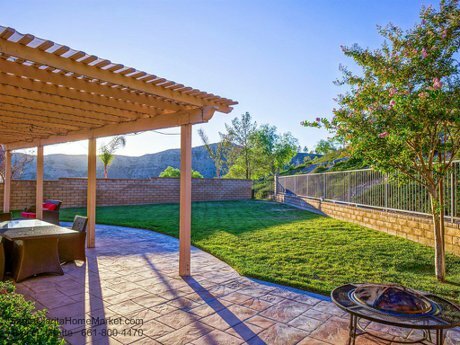 So many home buyers prefer some privacy in their backyard...this makes for a very desirable feature! When you first approach the front yard you are struck with how pretty the landscaping is. The front door welcomes you to an open foyer and beautiful interior with a sunny sitting room to the right - a perfect spot to enjoy a conversation, read a book, use as a office...well you get the idea. The living room and dining room are to the left of the foyer, and the high ceilings provide a well lit interior and very spacious open feel. The home offers over 2460 square feet of living space. There is a guest bathroom downstairs and direct access to the 2 car garage. 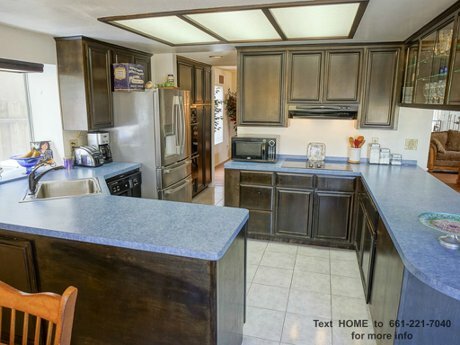 The kitchen has been updated, and features lots of cabinets and counter space. Some of the cabinets were designed to display your special items. There is a breakfast eating next to the kitchen, with a view to the backyard and the distant hills. The architecture of the homes on the hills make you feel like you're in a Mediterranean location. The family room is adjacent to the kitchen and has been beautifully expanded to provide more room for movie watching, games, and family and friend get togethers. 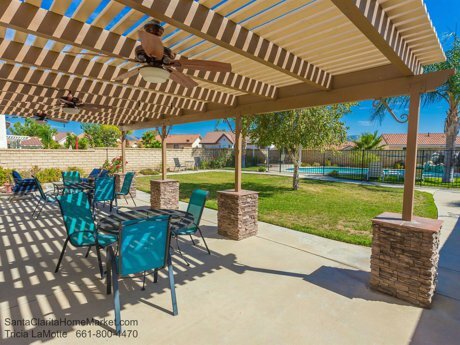 The backyard has an inviting patio area with room for entertaining and relaxing; there is also a grass and retaining areas for your favorite plants and flowers. There are no rear neighbors so you have privacy towards the back and a view. 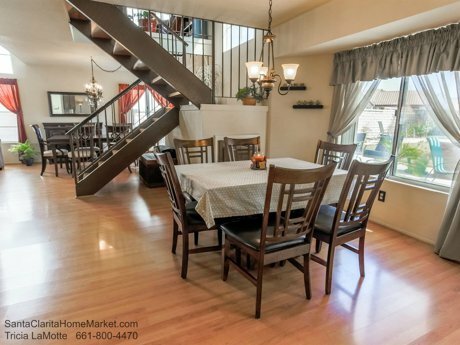 Going up the stairs to the second floor you will discover a large landing area or loft area. The four bedrooms are all upstairs. The master suite offers a sitting area and the master bathroom and also has a nice view looking down the tree lined street. 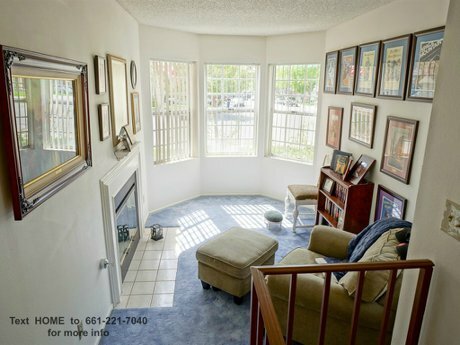 This home at 26828 Madigan Drive in Canyon Country is a real find, one you won't want to miss. 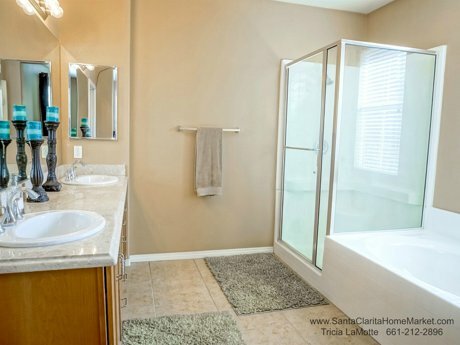 Contact Tricia LaMotte at 661-212-2896 to discover why this home may be the perfect solution if you are relocating to Santa Clarita in the north part of Los Angeles County, CA.